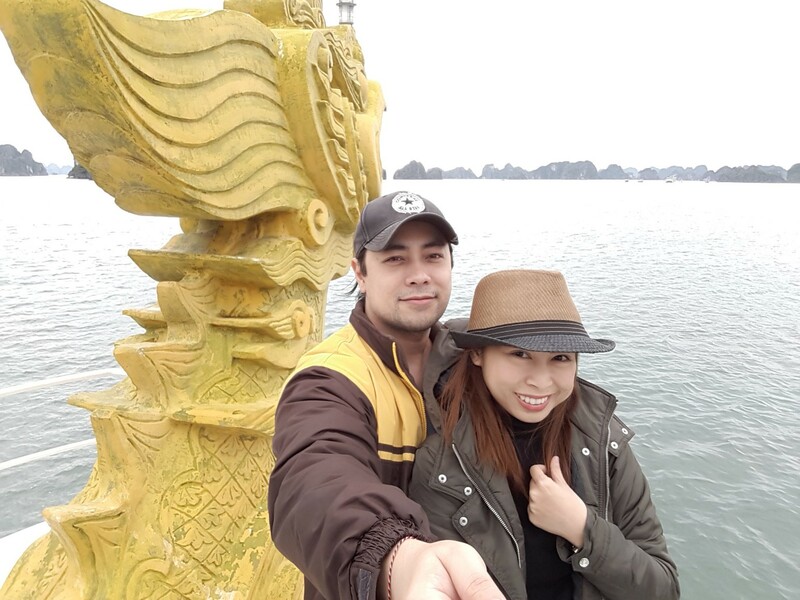 As if a trip to the charming city of Hanoi isn’t enough to make our wedding anniversary special, we made it EXTRA special by going on a Ha Long Bay / Bai Tu Long Bay cruise! 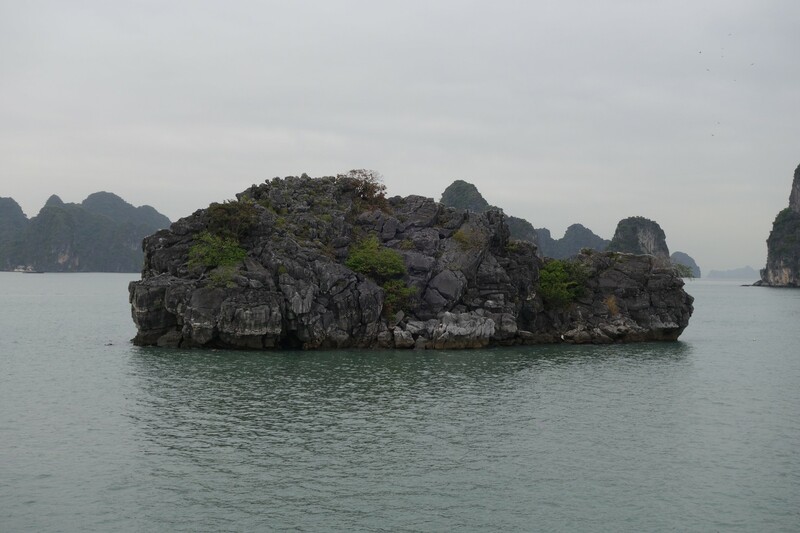 Ha Long Bay, located northeast of Vietnam, has been recognized as a UNESCO World Heritage site in 1994. 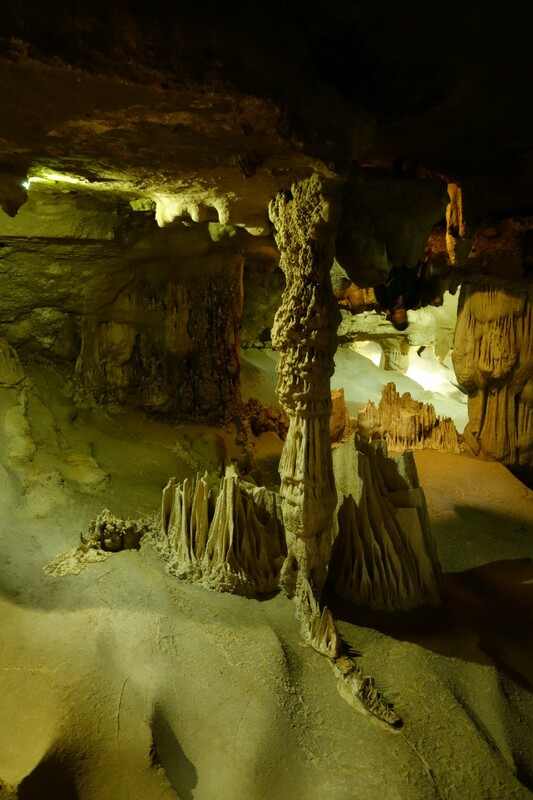 Known for its emerald blue waters and over 1,600 magnificent islands and limestone karsts, including mysterious caves and grottoes, this site was also named as one of the 7 Wonders of the World! How’s that for special? 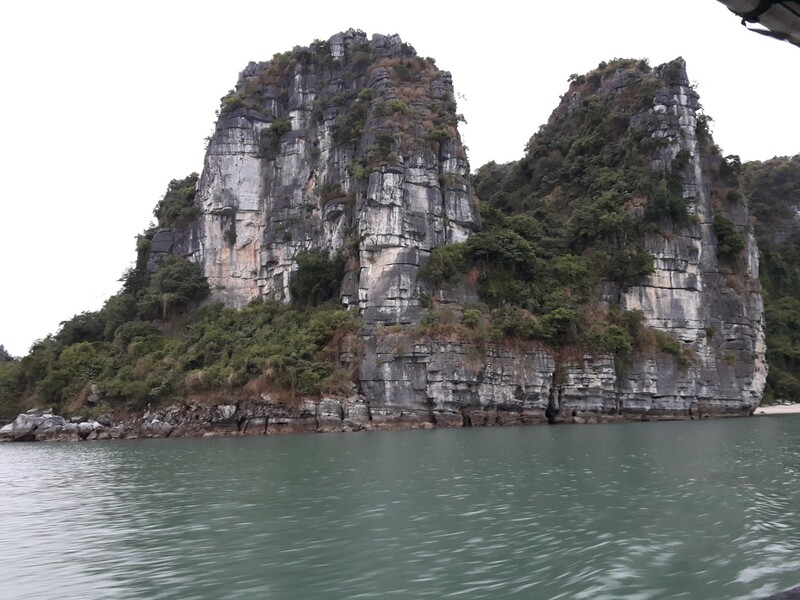 Even though we only had four days in Hanoi, I thought that it would be a shame to miss out on one of the world’s most majestic natural wonders, so we decided to do a 2-day / 1-night cruise. 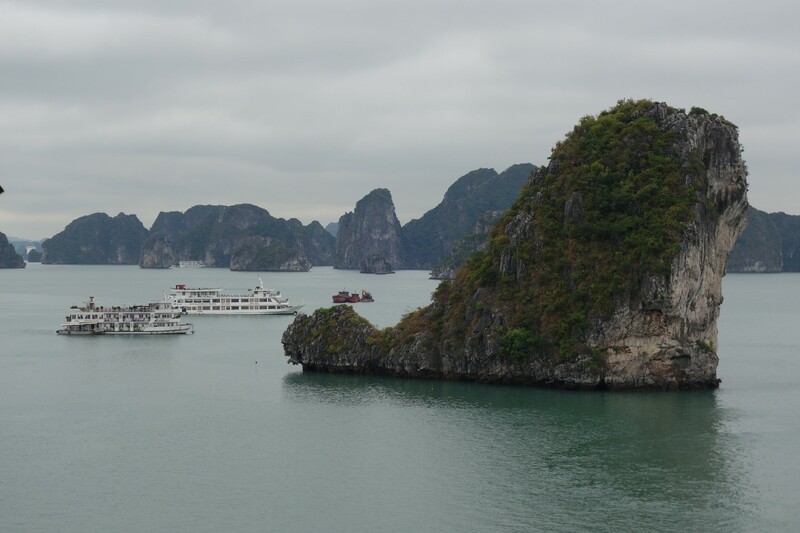 With about 500 Ha Long Bay cruise companies, the overabundance of options became extremely overwhelming! And if that’s not enough, I also had to be wary of scammers because there were plenty of those too. After hours and hours of research, I finally made my choice. 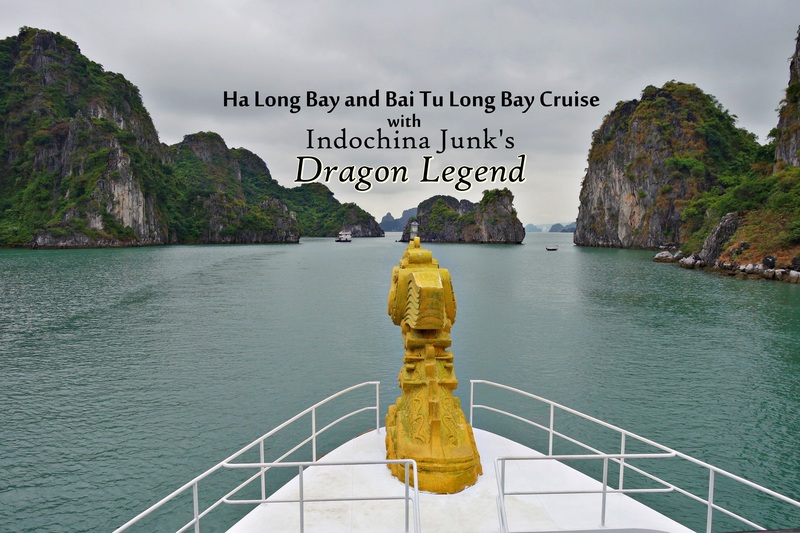 I decided to go with Indochina Junk’s Dragon Legend. From my exhaustive research and the many cruise horror stories I have read online (e.g. rats in cabins, boats catching fire, etc. ), one piece of advice was consistent in all the blogs and forums I’ve come across: YOU GET WHAT YOU PAY FOR. 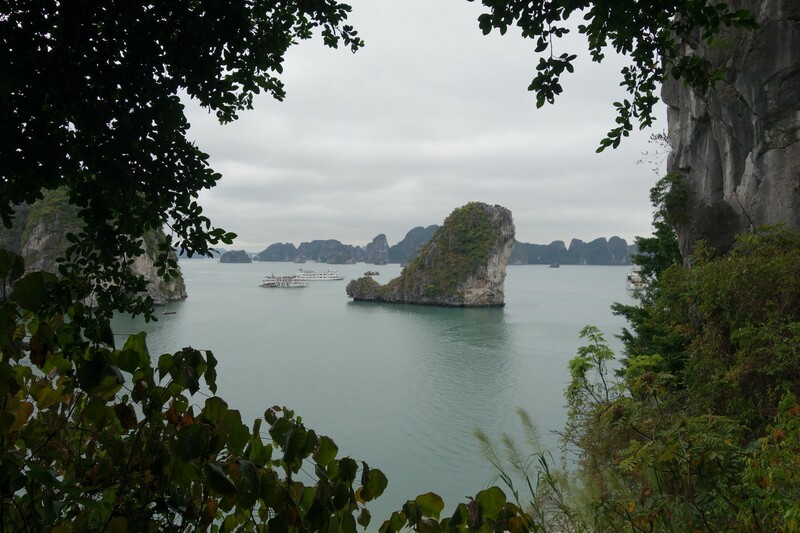 Indochina Junk is #1 on the list of TripAdvisor’s Ha Long Bay tours, with plenty of positive reviews! 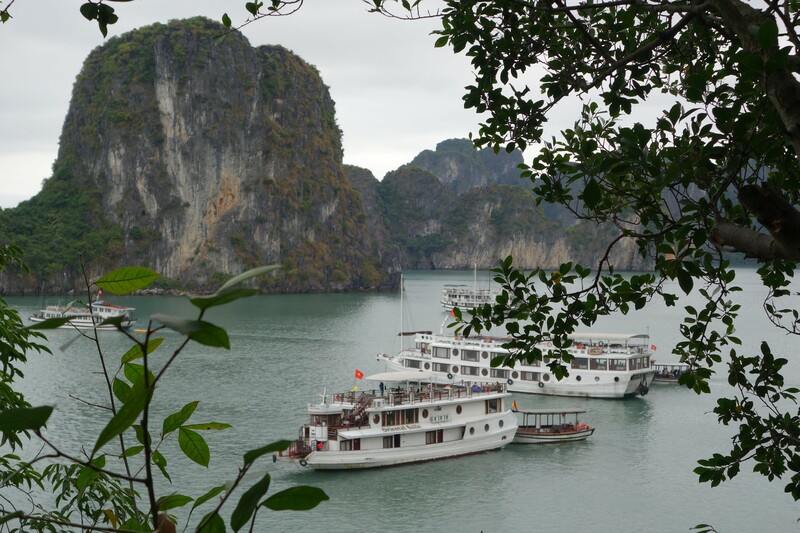 Indochina Junk has many cruise boats to choose from depending on one’s requirement and budget. 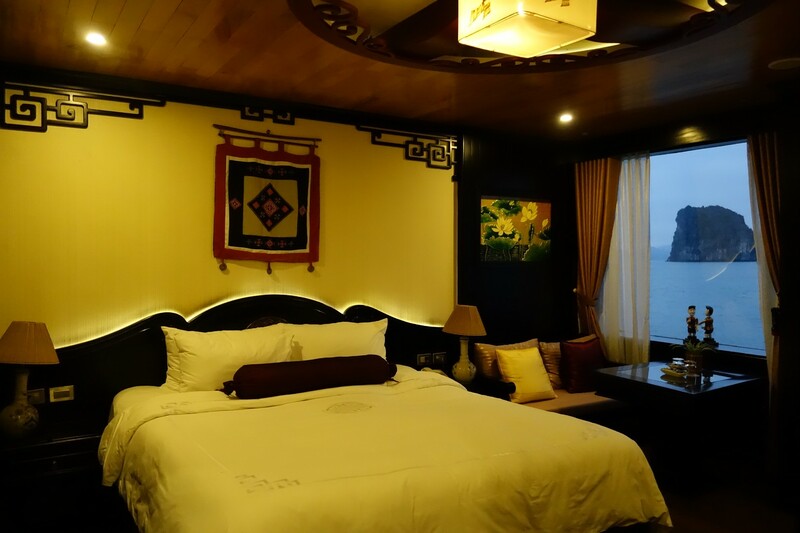 I chose the Dragon Legend because it’s very new, and as a 5-star cruise boat, the price is pretty reasonable — not cheap but not too painfully and ridiculously expensive either. 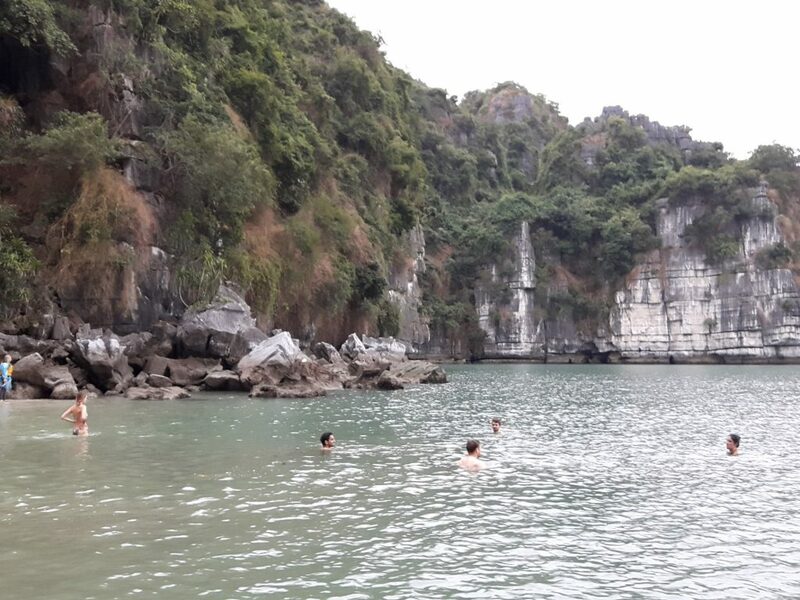 Most importantly, they travel to Bai Tu Long Bay, a secluded area northeast of Halong Bay, which is off the beaten track. 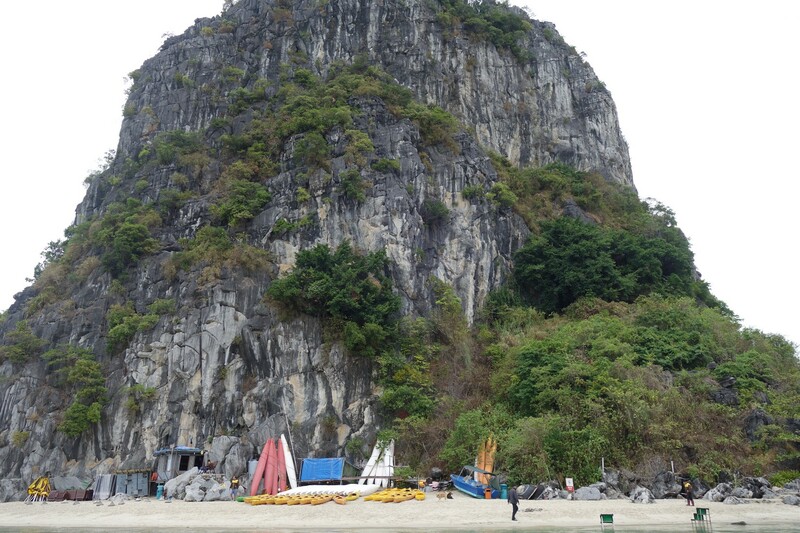 It is more laid-back and less polluted than the more touristy Halong Bay. 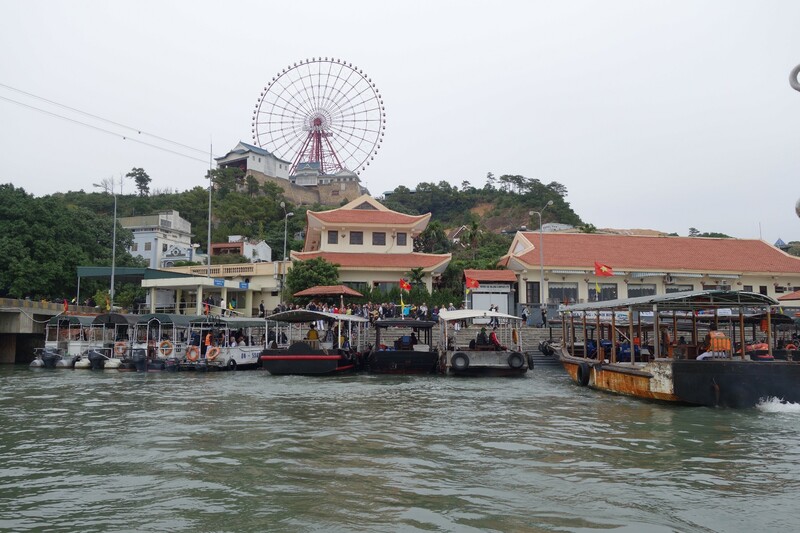 While there are other boats that take this same route, it is still less crowded, which meant that we could have a more peaceful experience and a more stunning and serene view of the bay. We had the whole bay to ourselves!!! Well, not really, but it sort of felt like that most of the time. 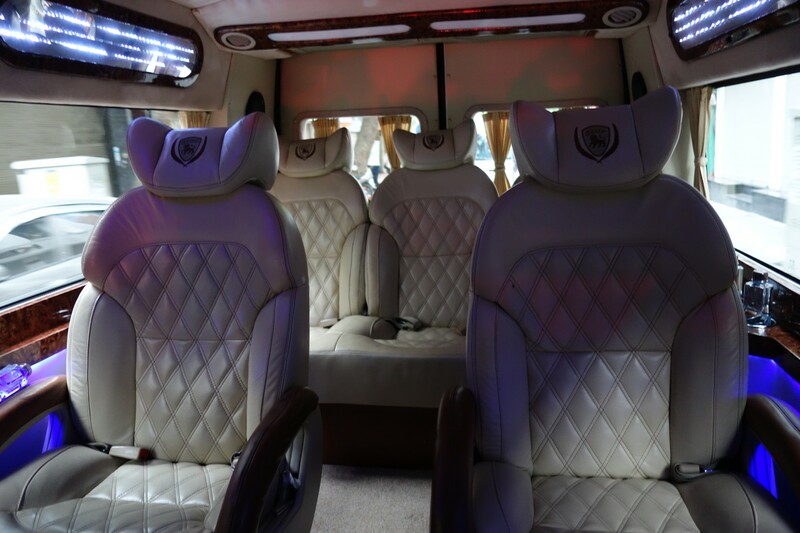 On the day of our cruise, we got picked up in our hotel at 7:00 AM sharp by the Indochina Junk luxury van. 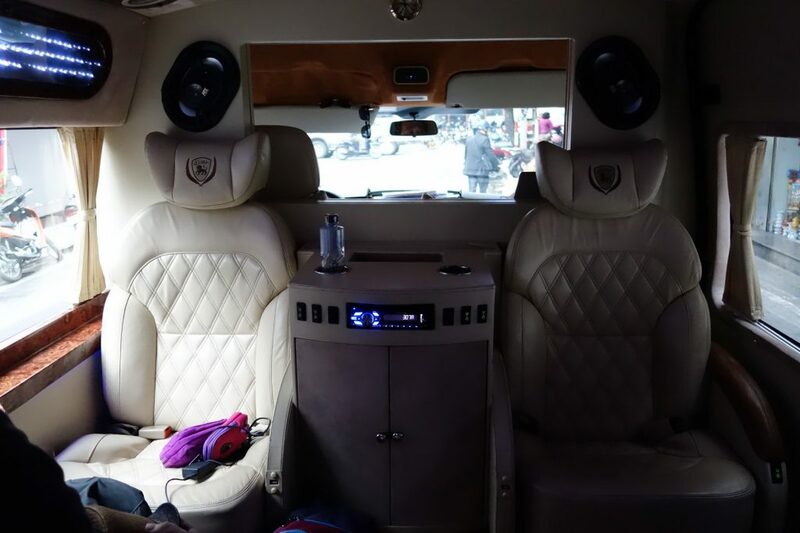 This comfortable 7-seater van has a minibar, reading lights, free bottled water, USB ports for charging gadgets, and fast Wi-Fi to keep us entertained! The minibar had nothing in it, really, but who cares? 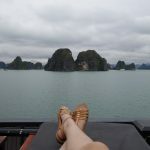 I wish we had the van all to ourselves, but after we got picked up, we then picked up the other passengers who were joining us en route to Ha Long Bay. Don’t expect to get some sleep in the shuttle if, like us, you’re sharing the van with passengers who jabber nonstop! 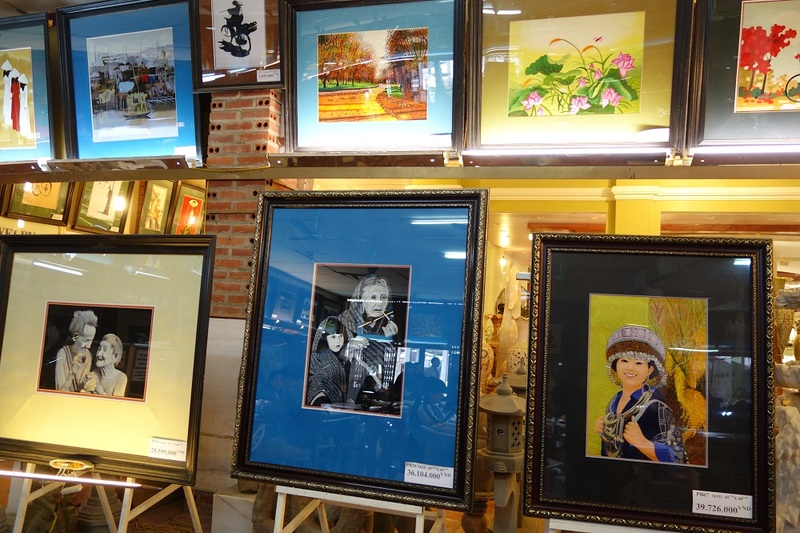 …and then the next, I was looking at peaceful rice fields and a family of ducks swimming in tranquil ponds. 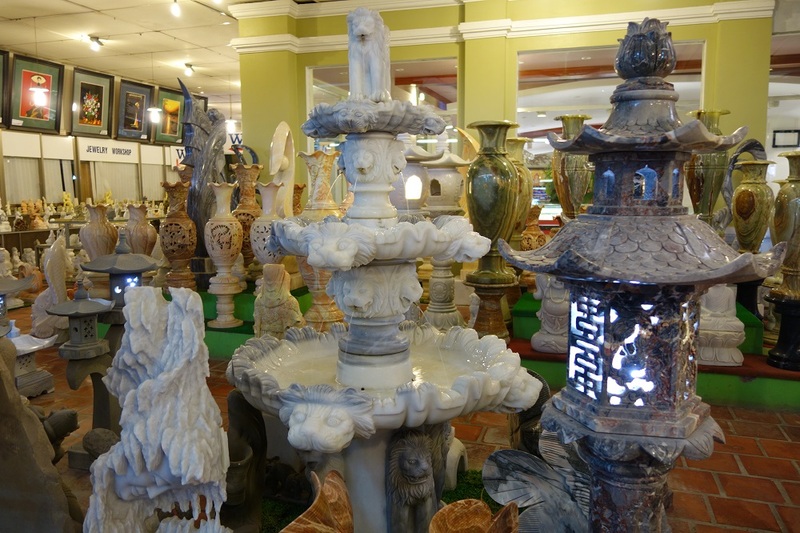 In the middle of the trip, we stopped by a souvenir shop selling everything from paintings to marble sculptures. I thought it was just going to be a quick bathroom break for everyone, but we were there for about 20 minutes, which was too long, especially since we all just wanted to get to the bay already. This stop is really meant for the van driver to rest a bit, but everyone suspects that it’s also some kind of tourist trap. Naturally, almost everything is overpriced here, including a can of Pringles sold for around 100K Dong / 4 USD (WTF?!). No one was forced to buy anything, of course. 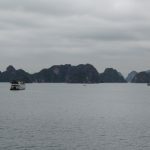 When we finally got to Ha Long Bay, we – together with the 45 passengers of the Dragon Legend Cruise – gathered at the receiving area of Indochina Junk’s office. A jolly and friendly man named Coco and a warm and motherly lady named Happy introduced themselves to us as our cruise / tour guides. Coco told us that we were very lucky because the tour almost got cancelled that same morning due to strong winds. 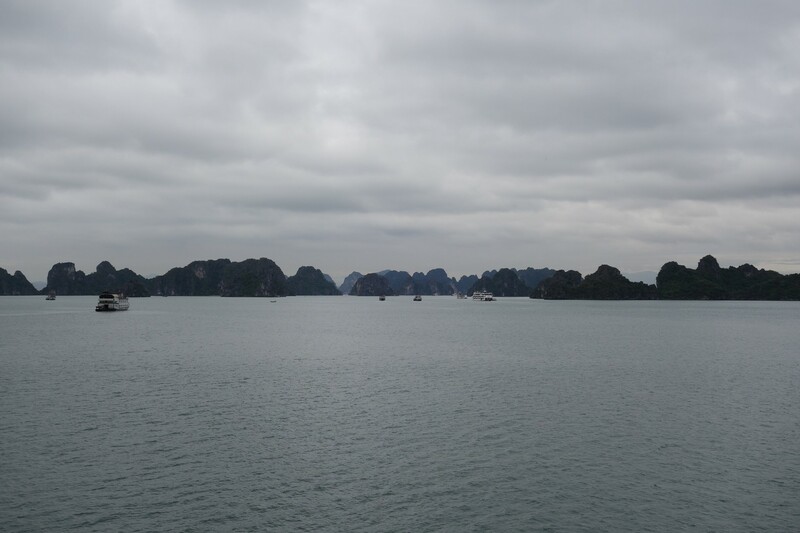 Imagine traveling 4 hours to Halong Bay only to be told “Sorry, no tour today! You just wasted 4 hours just to get here for nothing… and now you’re going to spend another 4 hours going back to the city!” What a hassle! 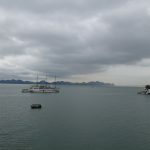 But apparently, it is not uncommon for the Ha Long Bay government to order last minute cruise cancellations due to the weather. I’m just glad it didn’t happen to us! 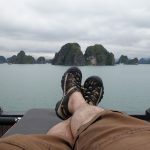 Prior the the trip, Indochina Junk asked us to fill out a form which asked for some of our details, including our dietary restrictions and preferences. 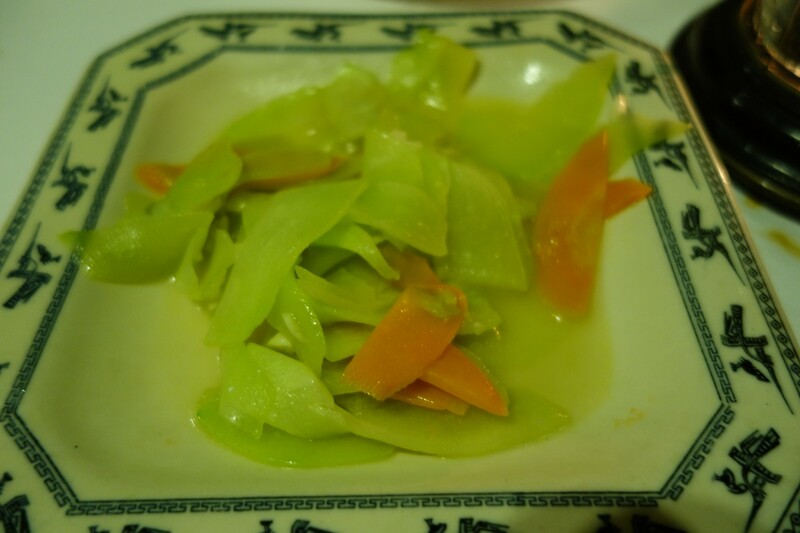 I told them in advance: “no capsicum / bell peppers, cucumber, and zucchini” and nothing else. So I was surprised when Coco sat down beside each one of us to clarify our food requests, and asked me, “No spicy food, right? No watermelons? No pumpkin?” Ehh??? Where did that come from? We were there for a long, long time (seriously, what time is it?). I don’t know what we were waiting for, and I could tell that the other passengers were getting really impatient too. We paid a lot of money to get on that boat and we really just wanted to make the most out of it. 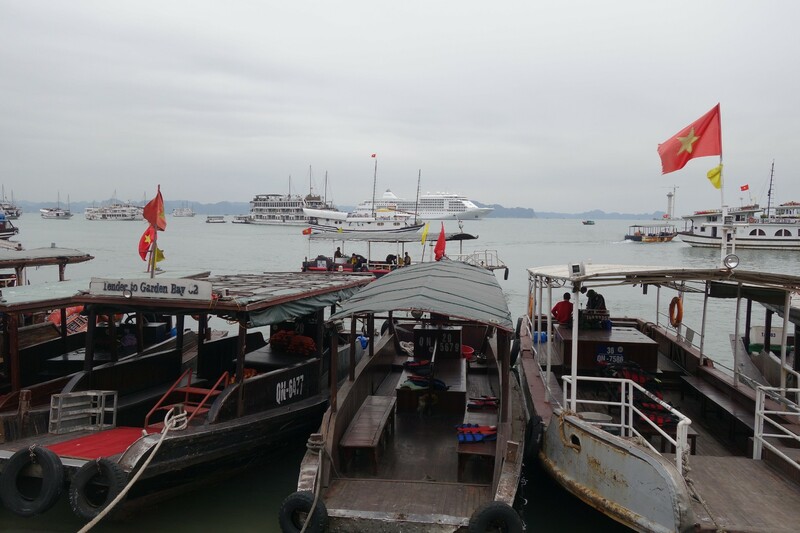 Finally, after what seemed like a century of waiting, we were all escorted to the port where we boarded our boat. 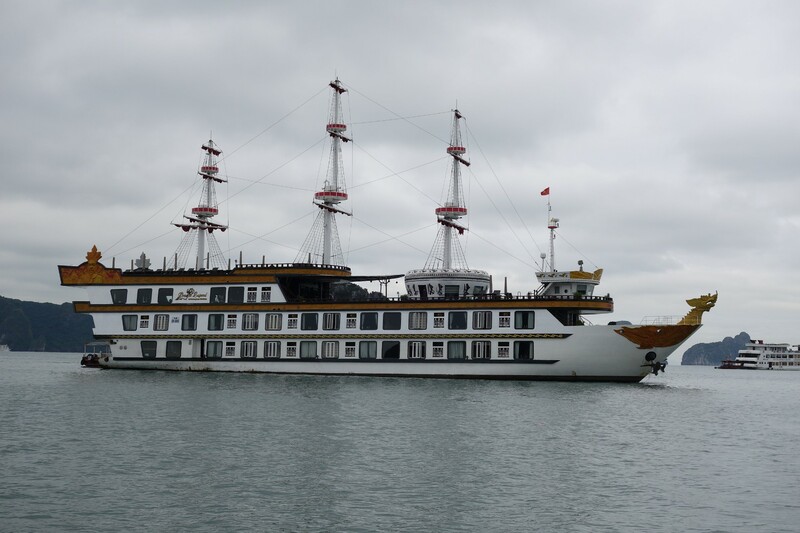 Aaaand… this is our luxury cruise boat! Just kidding. Don’t worry, it’s much nicer than that. Ahh… there it is! Say hello to the Dragon Legend 2! What a beauty! 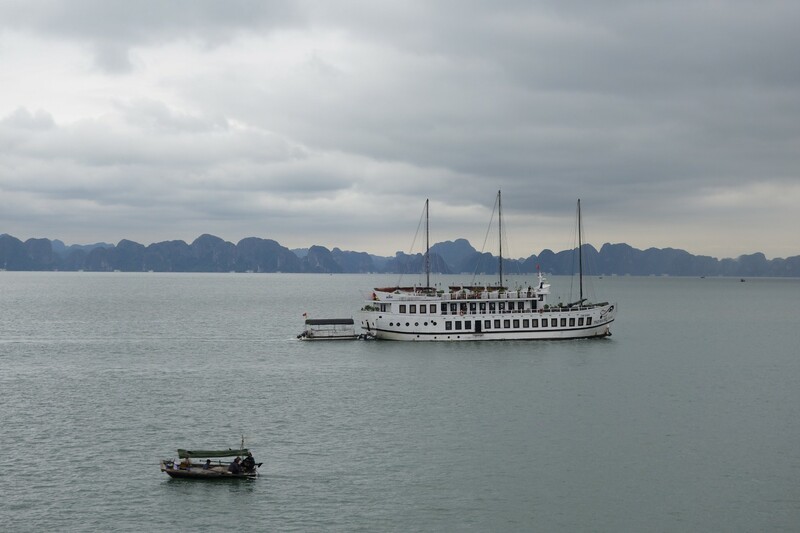 Indochina Junk has two Dragon Legend boats: Dragon Legend 1 and 2, the latter being the newest one, which we were lucky to be assigned to. 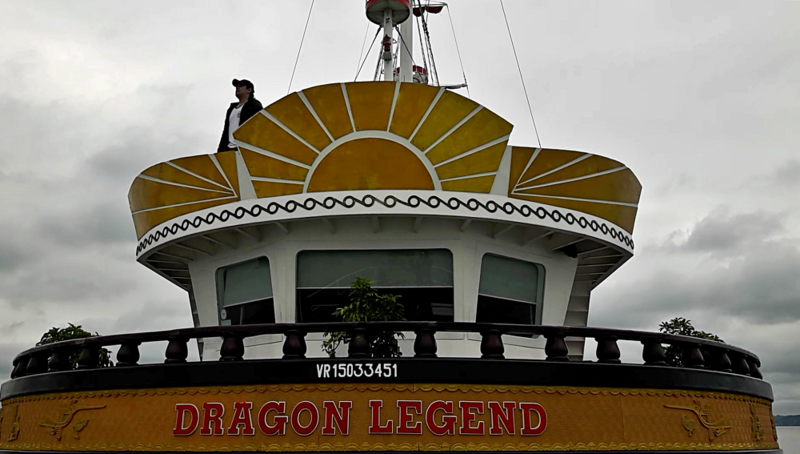 There were plenty of boats in the bay, but the Dragon Legend was the largest and the most regal one of all! It really was like a dragon – enormous and impressive, commanding attention and inspiring awe! 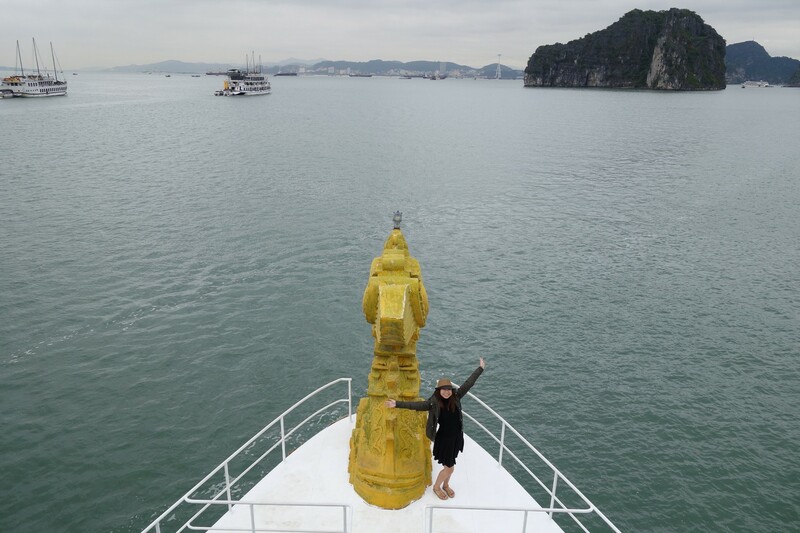 As we approached the boat, the staff of the Dragon Legend were all waving at us and welcoming us with big smiles. 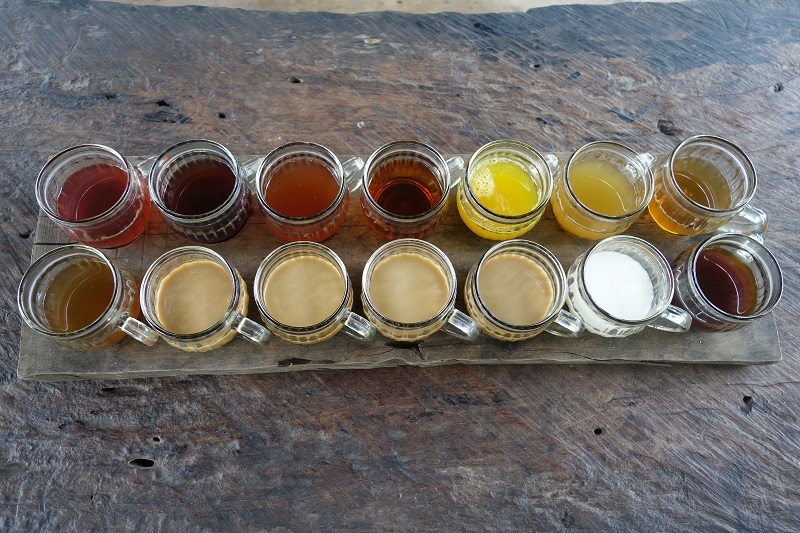 As we stepped inside the boat, we were given hot wet towels and a cup of the most delicious ginger tea I’ve ever had. 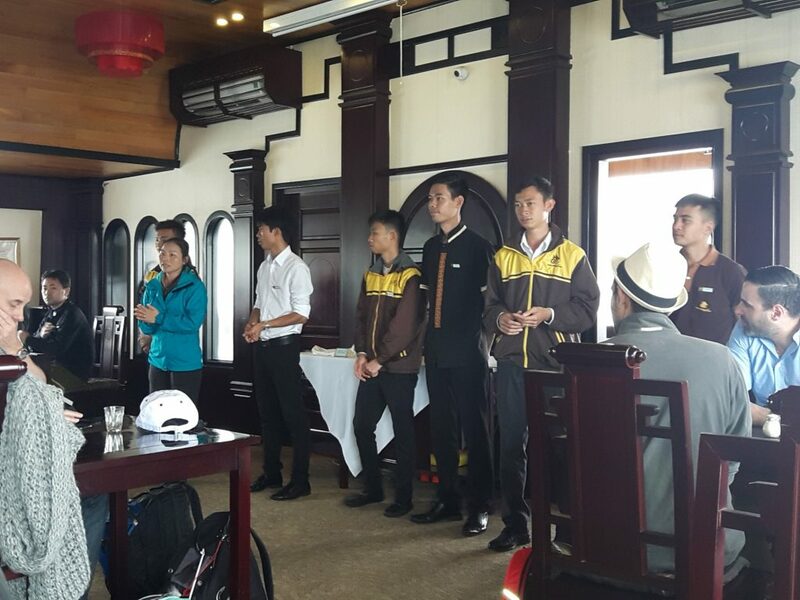 We were then directed to the dining hall for a briefing about the boat and the cruise activities. It would have been more efficient if they only briefed us about the most important things and then just left a copy of a printed itinerary in our rooms. 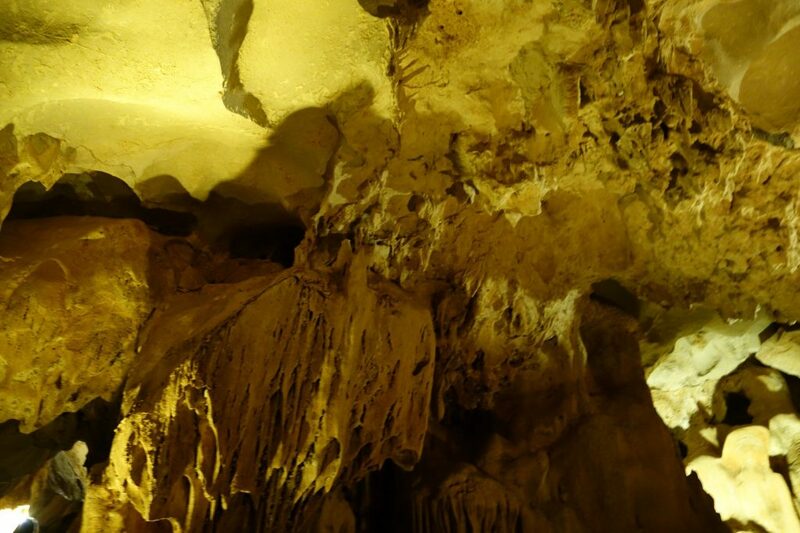 Anyway, the itinerary is in their website, and I’m sure many of us have seen that before going on the trip. Finally, we were given the keys to our room so we could freshen up. Our cabin became our favorite part of the entire boat! Talk about luxury!!! 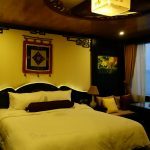 Our cabin on the Dragon Legend was so beautiful! 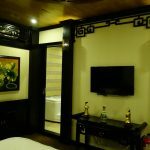 Staying in this stunning suite with its lovely Vietnamese décor and rich wood paneling made us feel like we were really living it large! 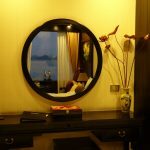 I wanted this cruise to be special, and this room alone already made it special. We had a massive bed with a comfy mattress and soft pillows. 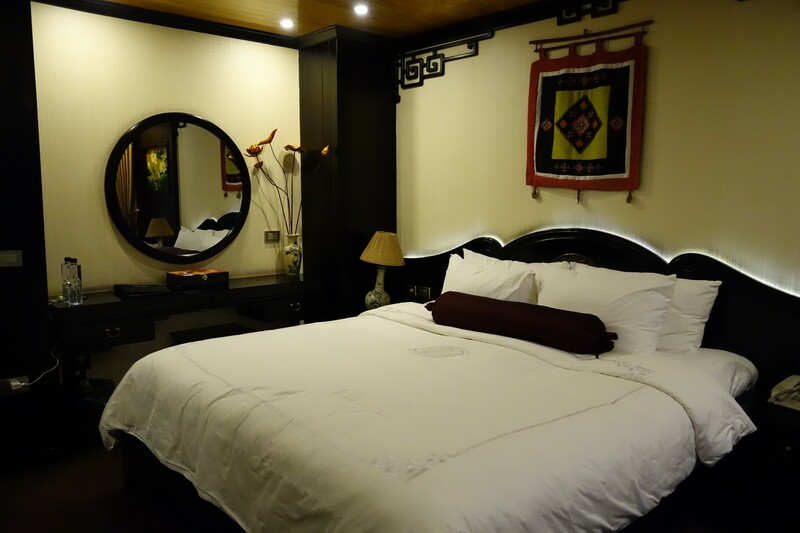 I plopped down on that bed and within a few minutes, I was sleeping like a baby! Our cabin also had a large dresser with a mirror, a big wardrobe, air conditioning, a TV, and an electronic safe. We were also supplied with our own life vests and fire extinguishers so we knew that the company really cared about our safety. 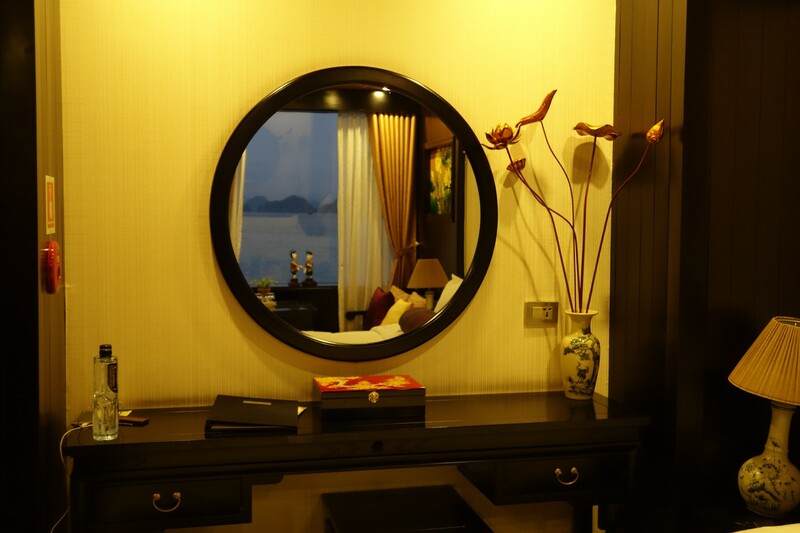 We even had a lounge area where we had a nice view of the bay from the comfort of our own room! 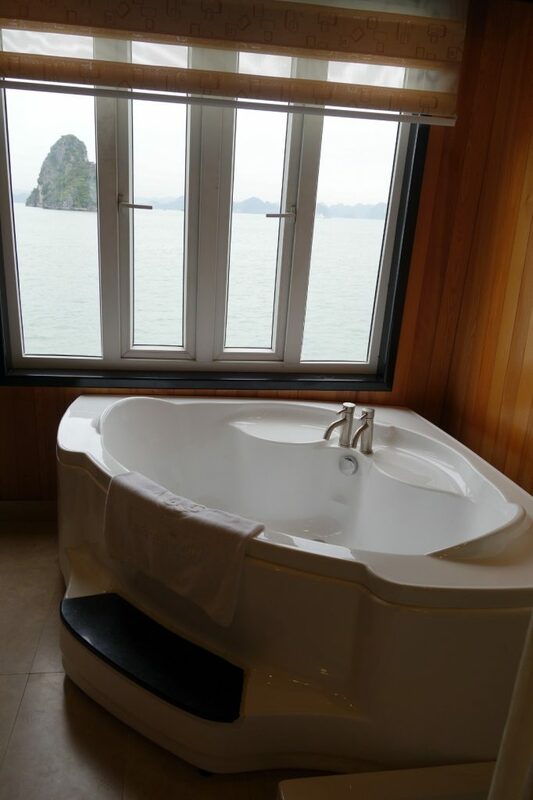 We enjoyed a great view of the bay too … from our fancy bathroom Jacuzzi! Ahh… now all I need is a glass of wine! 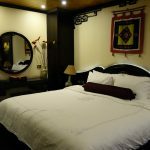 We absolutely loved our room, and our only complaint was that we didn’t have enough time to really enjoy it. We were always out and about, and it would have been nice to have more time to take advantage of this beautiful cabin. Finding a good spot to hang out in this boat was not a problem, because there were plenty! 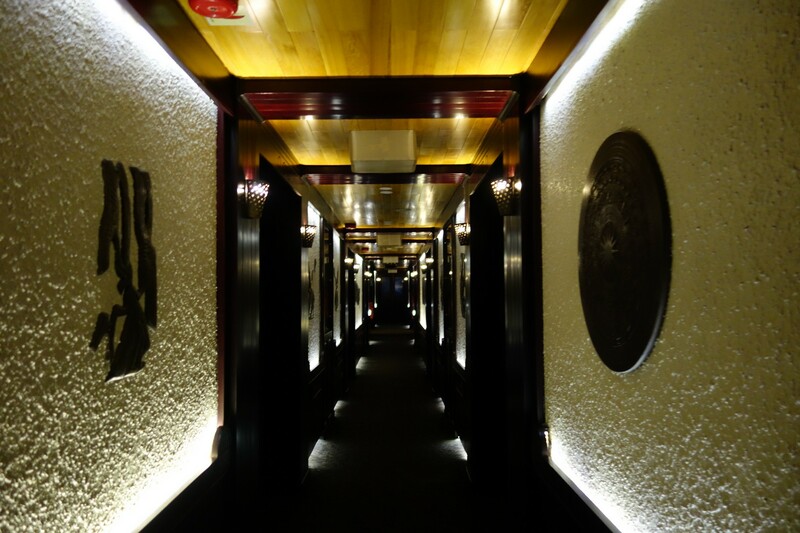 After about 15 to 20 minutes, the voice of Happy resonated through the intercom, which was heard in all the rooms. She was calling us back up to the restaurant area for our lunch. 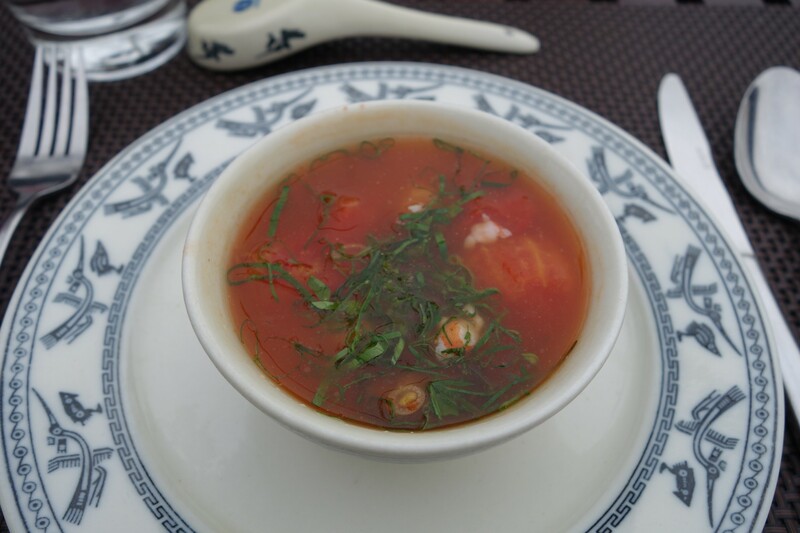 Depending on the weather conditions and the guests’ preferences, lunch can either be served inside the restaurant or in the outdoor dining room. 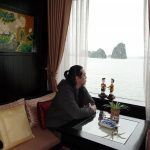 I’m glad most of the people voted to dine outside, where we could have our meals while admiring the view of Bai Tu Long Bay! The setup was what could be called as “family style” – the tables are arranged very close to one another, so you can hear (or join in on) the conversation of the people on the next table. This is good if you want to make new friends, but not so good if you want some privacy. Luckily, the couple sitting next to us was nice and fun to talk to! At the start of our lunch, the staff went around and asked us about our food preferences and dietary restrictions… again! 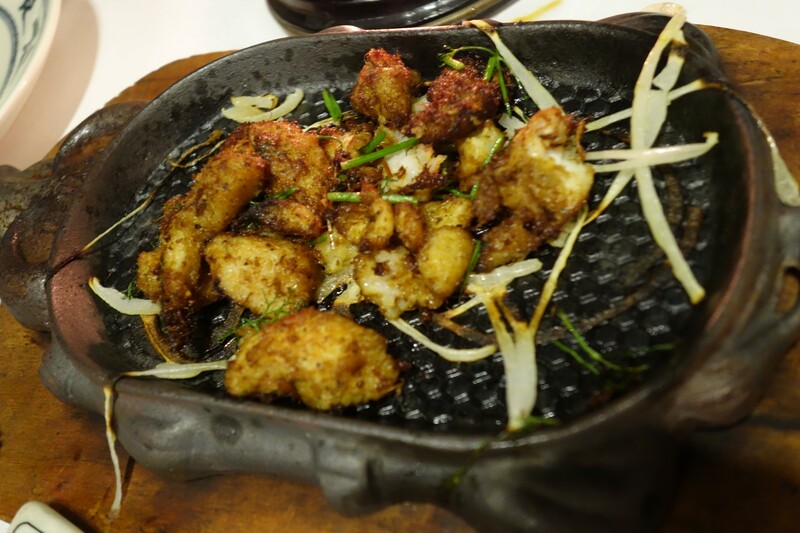 It was another round of “no spicy food, right?” (I never said that!) I understand that they just want to get everything right, but I thought that was the reason why we filled out a form in the first place? 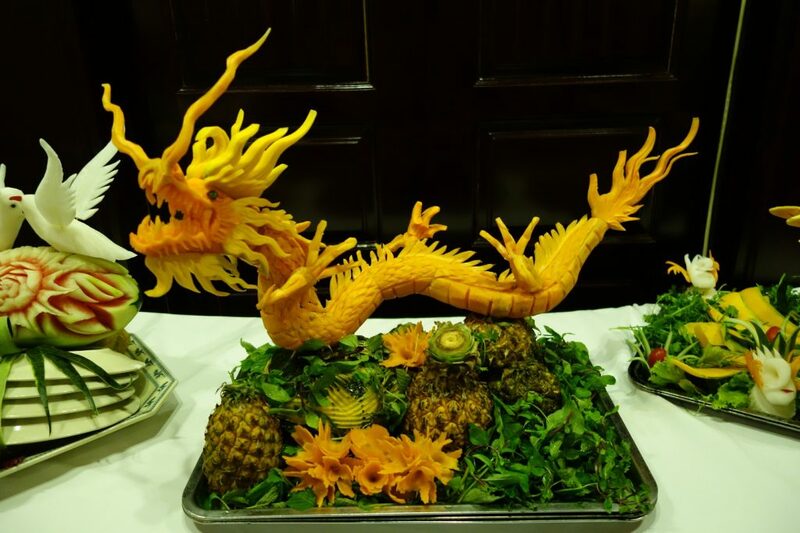 The Vietnamese really do love their veggies! 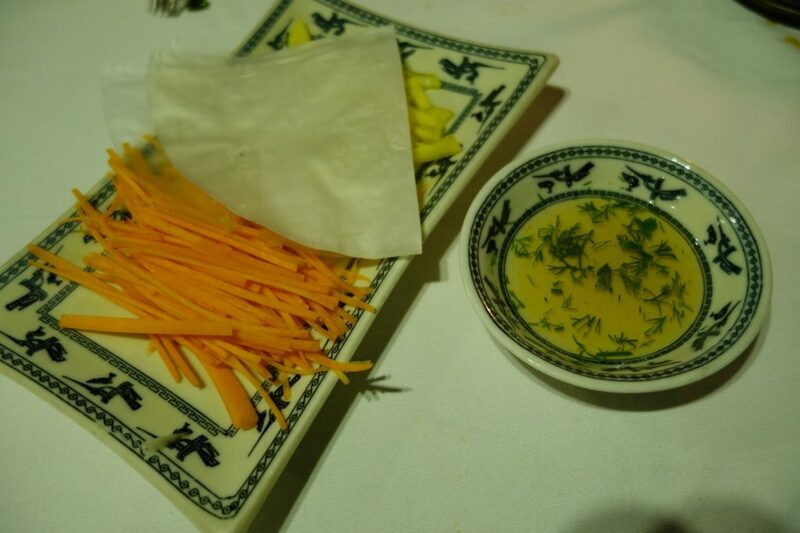 Every dish had some kind of vegetable garnish. 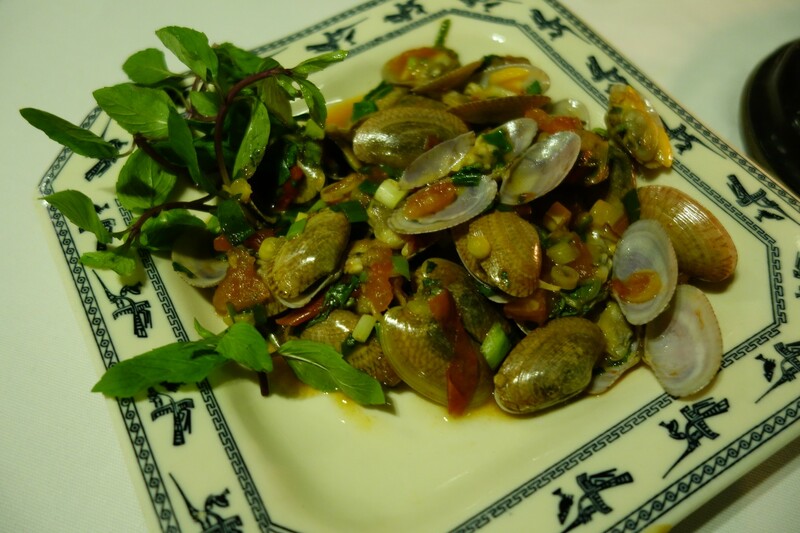 I felt so healthy, eating mostly vegetable and seafood. 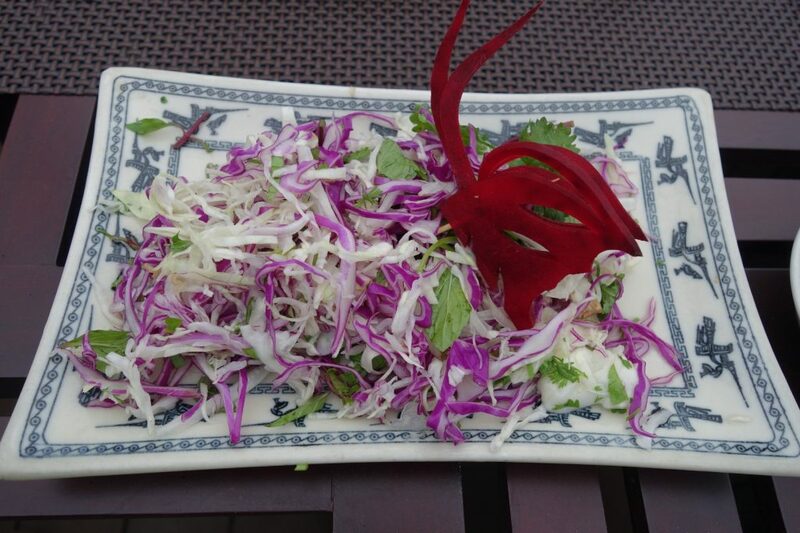 Mike describes the cruise food – at least the vegetable dishes — as “garden-y,” as in, they taste like a garden. No, my husband hasn’t eaten a garden before, but what he means is that the dishes are zesty, tangy, and aromatic, with herb-like flavors. 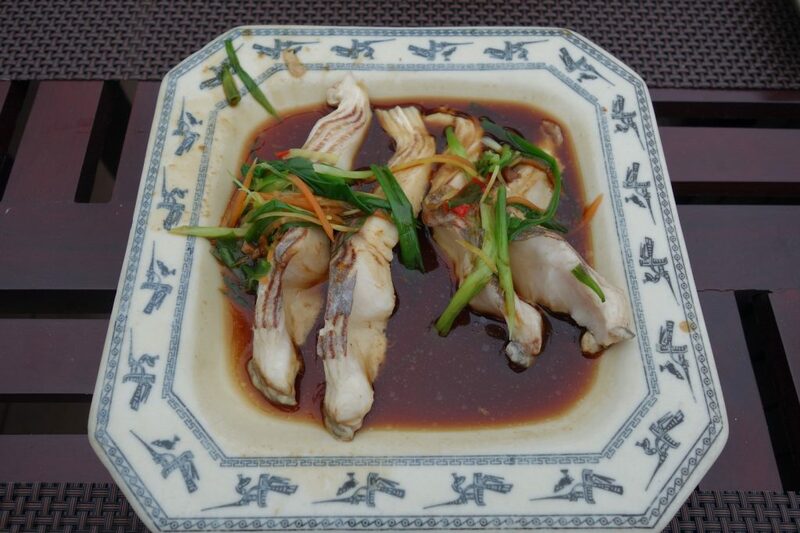 I like food that tastes garden-fresh, so the lunch meals were a treat for me! Drinks – with the exception of the water – are not included in the lunch. You have to order them separately. The service of the staff during lunch was pleasant. Every now and then, Happy or one of the guys from the boat would approach us and ask us if everything was okay and if we were enjoying our food. That was nice of them to check up on us and try to get to know us a little. However, after about the 4th or 5th staff approached us, it started to feel a little too much. I’m sure they meant well, but we really just wanted to eat and enjoy the view, the food, and our time together without someone having to approach us all the time. Even the couple sitting next to us were commenting that the staff were being a little “too friendly.” Everyone working in the boat was lovely and kind, though, no doubt about that. 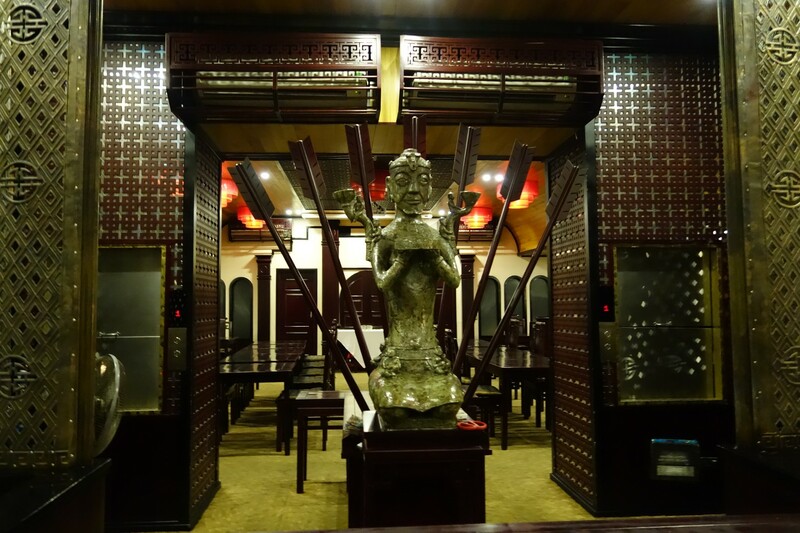 Lunch on the Dragon Legend was really a unique and cool experience! 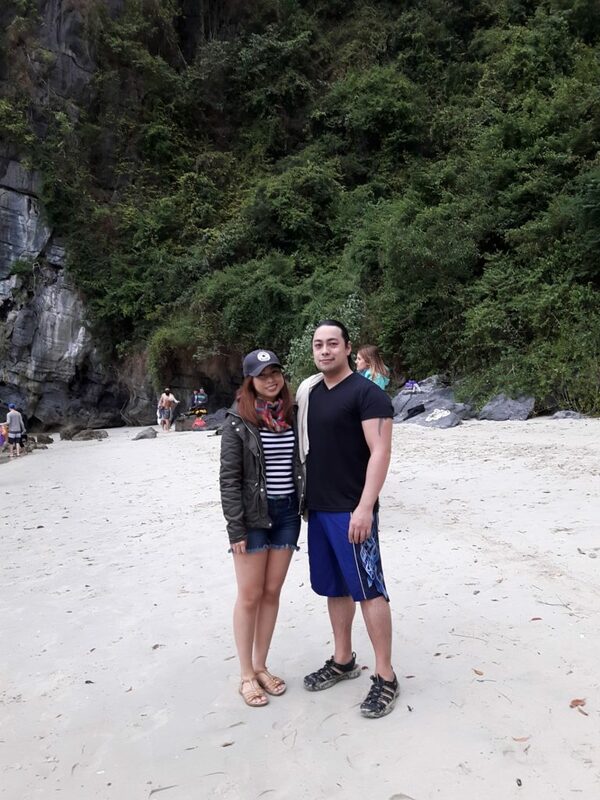 While waiting for our food to be served and also while eating, there were plenty of things to see – a convocation of eagles flying around, traditional fishing boats, and of course, the fascinating islands and limestone karsts! 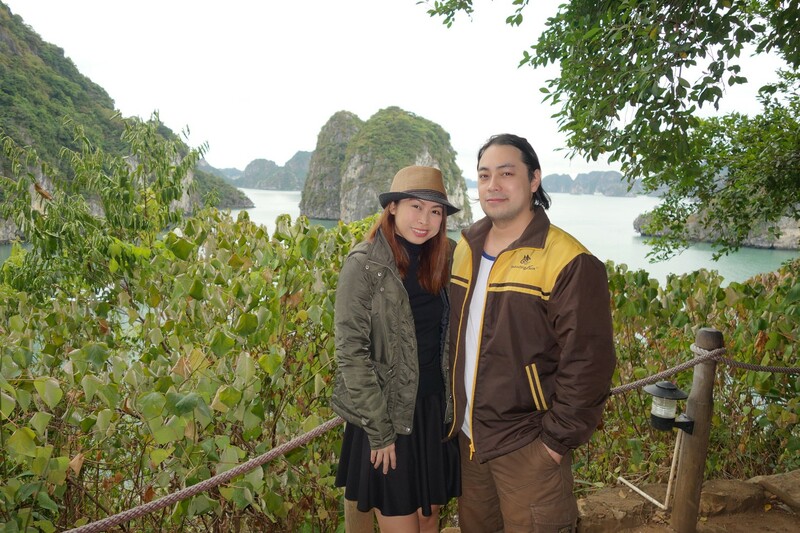 We went in November, which was autumn in Halong Bay and Bai Tu Long Bay. 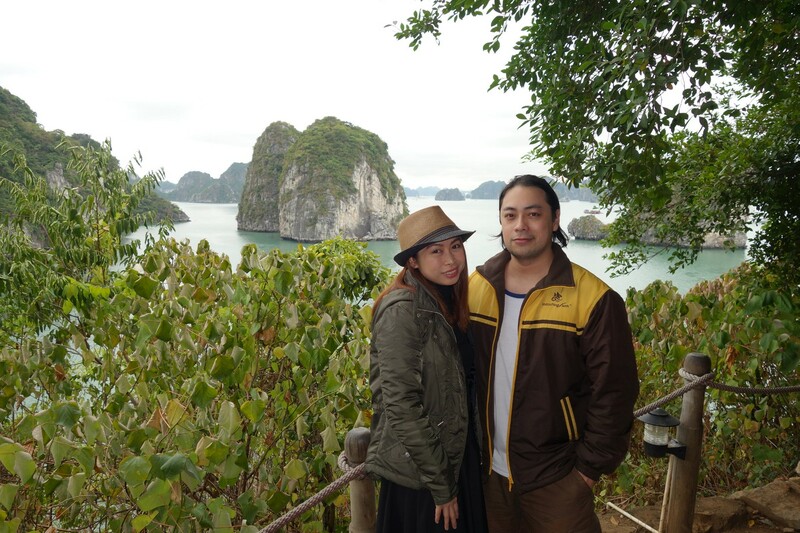 In fact, it was already approaching winter at that time so when we visited the bay, it was about 15º and it was freeeezing! They say that November is one of the best months to go on a cruise because of the cool weather. 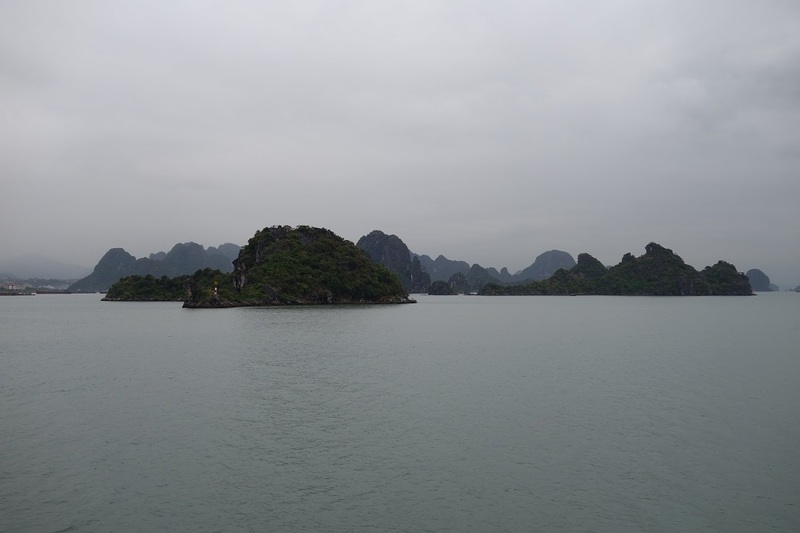 During this time, the scenery is much more gloomier and the sky is more overcast. 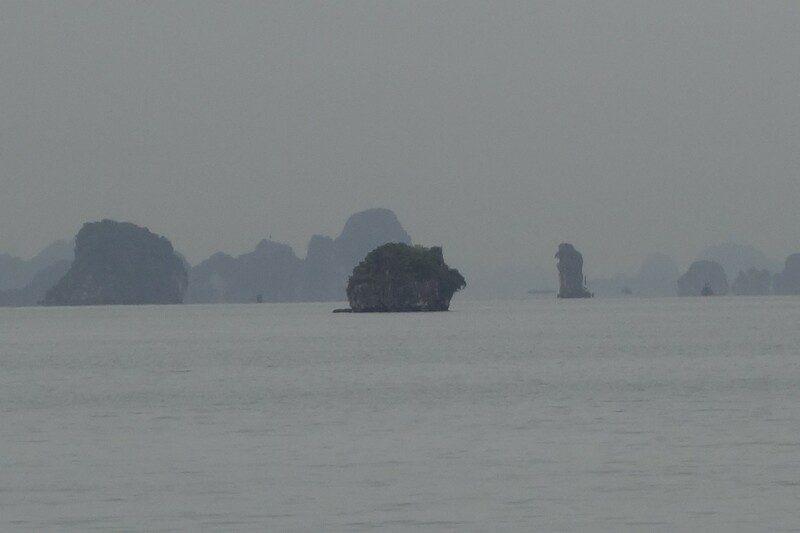 While it would have been nice to have some sunshine, there was something eerie and dramatic about the cold and foggy Halong Bay in autumn and winter — it was hauntingly beautiful. While enjoying our lunch, we also had fun trying to make out the shapes of the different islands. It looks like a turtle! This one also looks like a turtle… but a sleeping one! 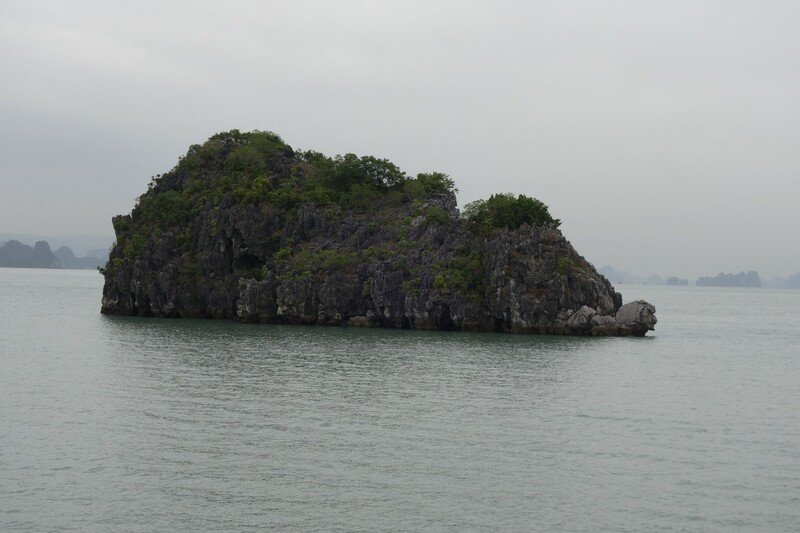 We call this “Booboo Island” because it’s shaped like our guinea pig, Booboo! After lunch, we were given an option to either go kayaking or to stay in the boat. Of course we chose to go kayaking! 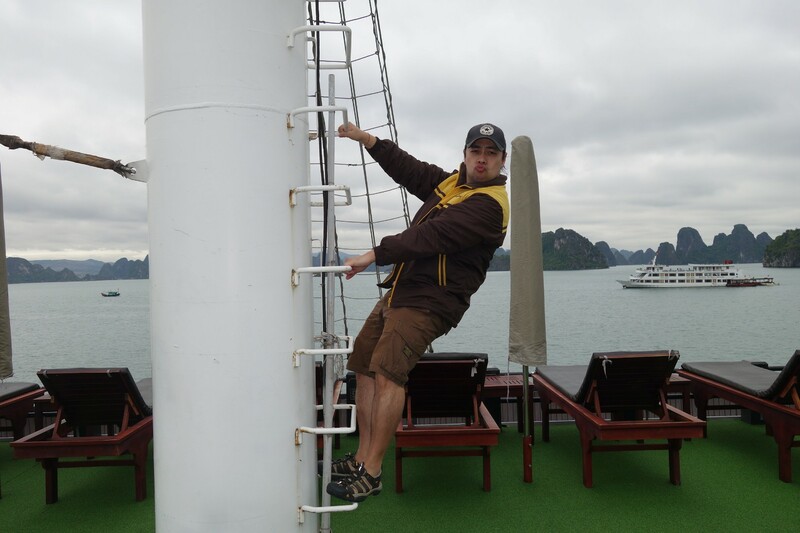 It was one of the activities I was really looking forward to for this cruise! 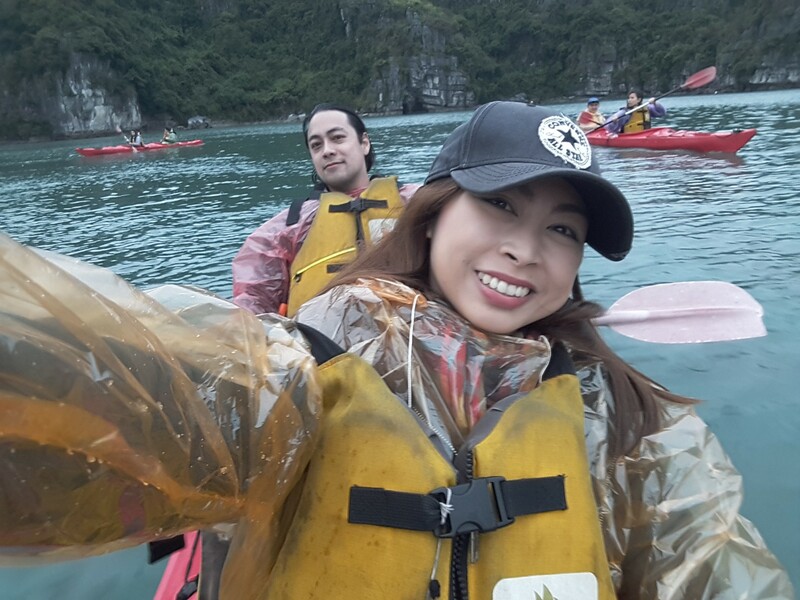 Before we went off on our own to kayak, we were given a plastic poncho to wear over our clothes, plus a dry bag where we could keep our valuables. Mike’s job: Paddle. My job: Selfie. 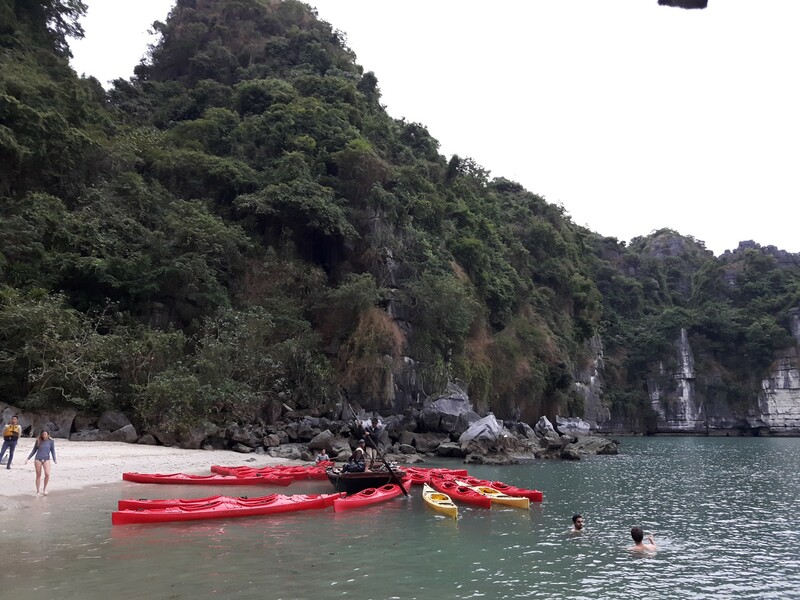 We parked our kayaks on the shore and took photos while some of the guests took a dip. 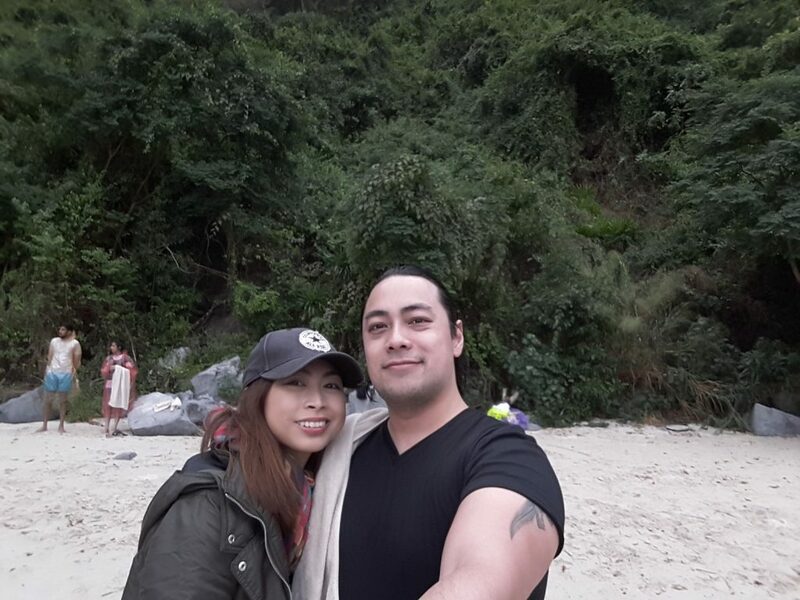 Despite the chilly November air, the water was still nice for swimming. But because we were too lazy to get changed, we didn’t bother. After the water activities, we went back to the boat to rest a little before dinner time. Dinner was a full production number! 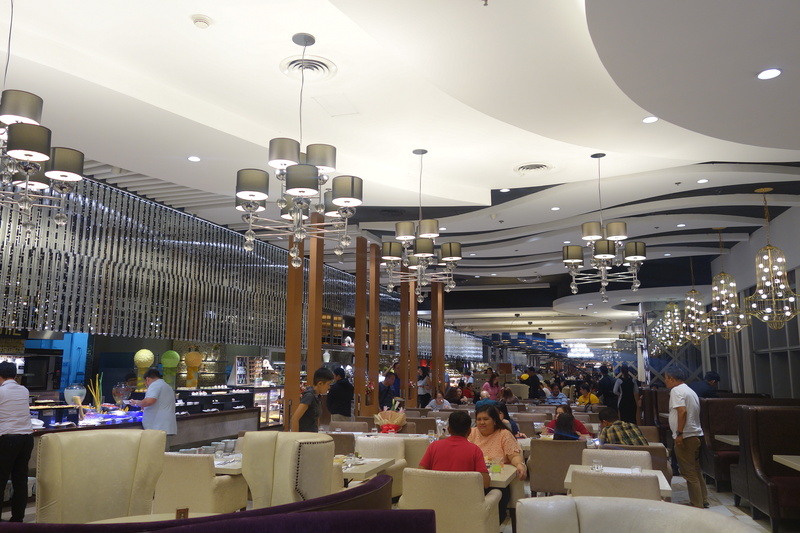 The lights were turned off, and one by one, the staff came in, singing “Happy Birthday” while holding a cake with a lighted candle as they made their way to the birthday celebrant. The rest of us clapped along. 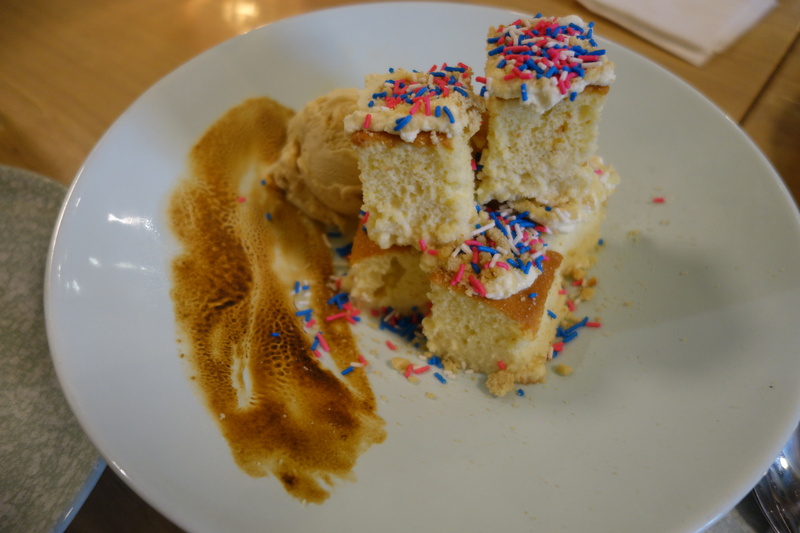 After that, the staff brought in two more cakes and they were making their way toward… wait, is that cake for us?! Coco started wishing me, Mike, and the couple beside us a “Happy Anniversary” and wished us a happy marriage. How sweet! 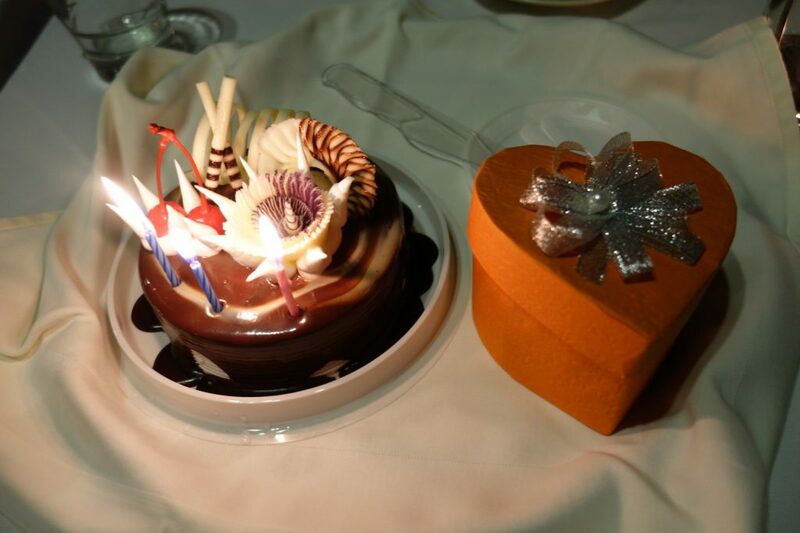 Aside from the cake, they also gave us a small gift placed inside a heart-shaped box. What a thoughtful gesture! I wanted to take a photo with the cake first before we blew out the candles but Coco wouldn’t carry on until we blew them out, so that was a bit awkward! But everything else was wonderful, and we really appreciate the thought they put into making us feel special. 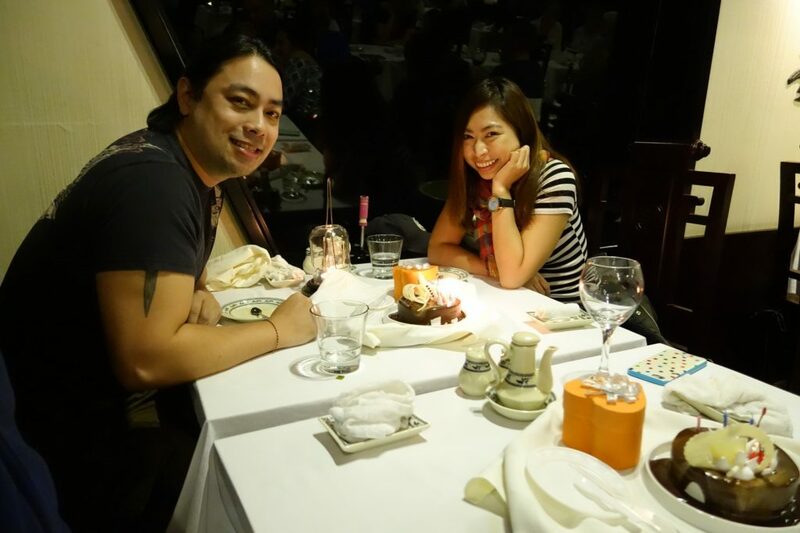 While the surprise was unforgettable, sadly, the food for dinner was the total opposite. We preferred the food served during lunch. 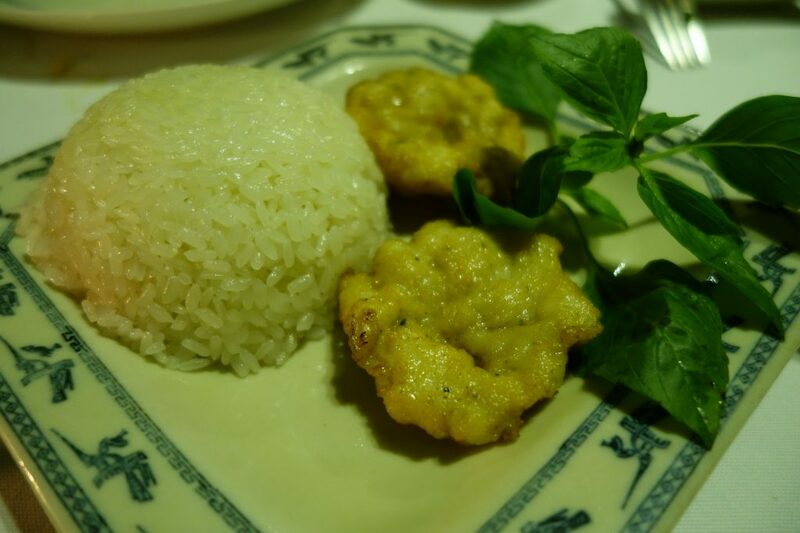 a) They served rice to make the meals more filling, considering the servings were pretty small. 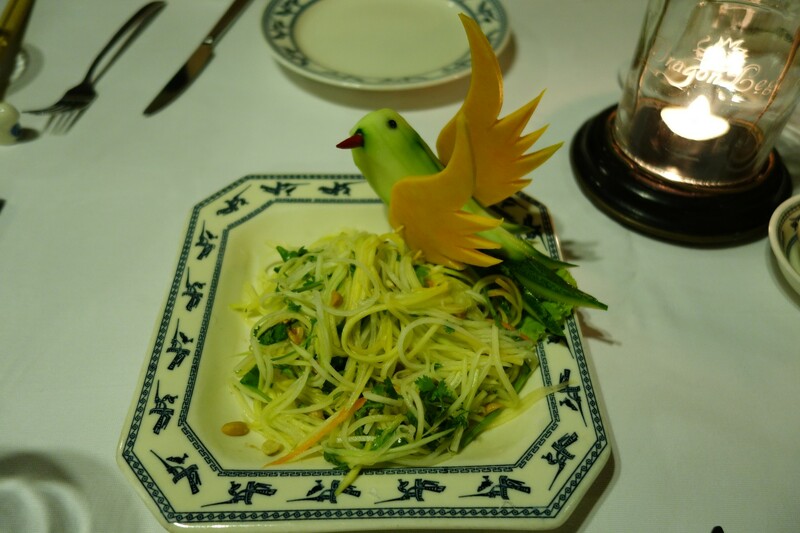 But of course, there is no such thing as “perfect,” and while the food has a lot of room for improvement, the people at Indochina Junk really try to make the whole cruise experience outstanding. 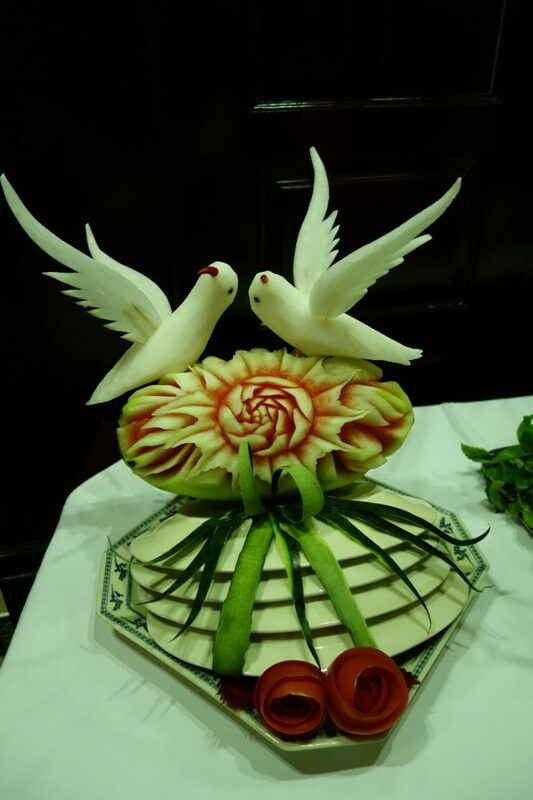 While we were eating, Coco told us that some of the cruise staff are gifted with their hands, and during their free time, they create intricate sculptures made out of fruits and vegetables! 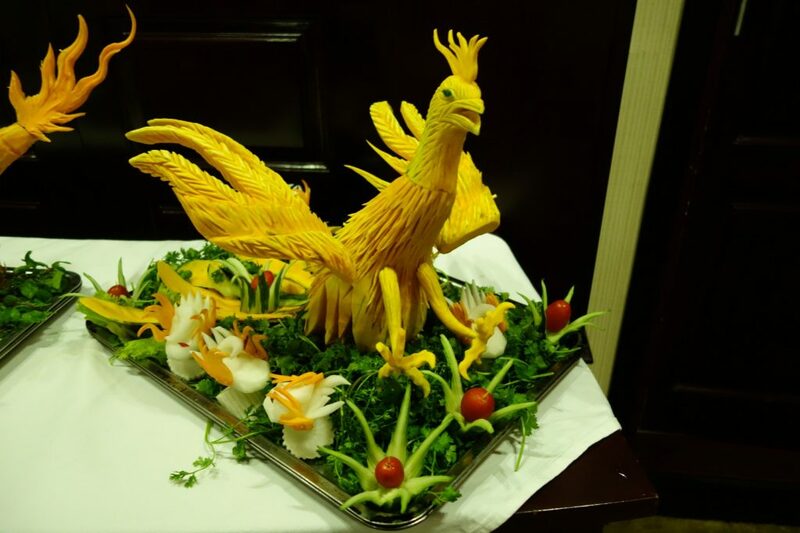 The staff at Indochina Junk are not only great hospitality professionals and talented food artists, but some of them are musically inclined too! 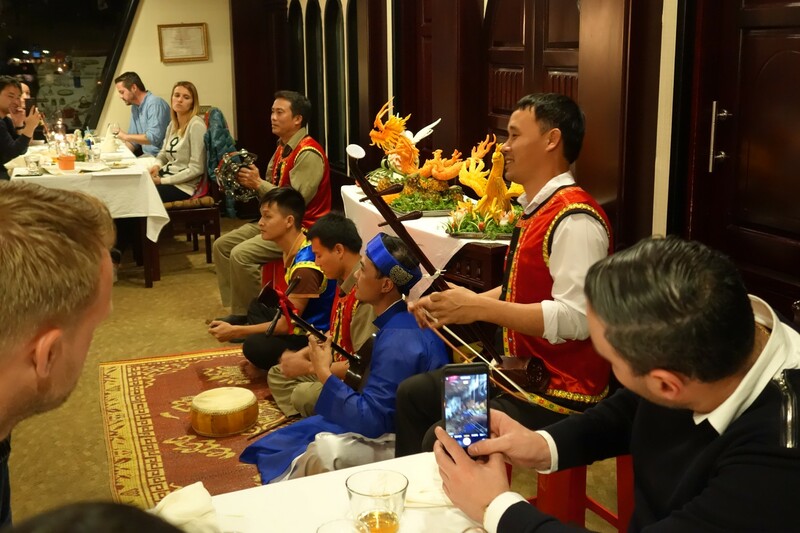 Toward the end of dinner, we were treated to an entertaining musical performance by some of the staff, who performed a Vietnamese song… in full costume! That was wonderful. After dinner, I decided to go around and explore the boat on my own. 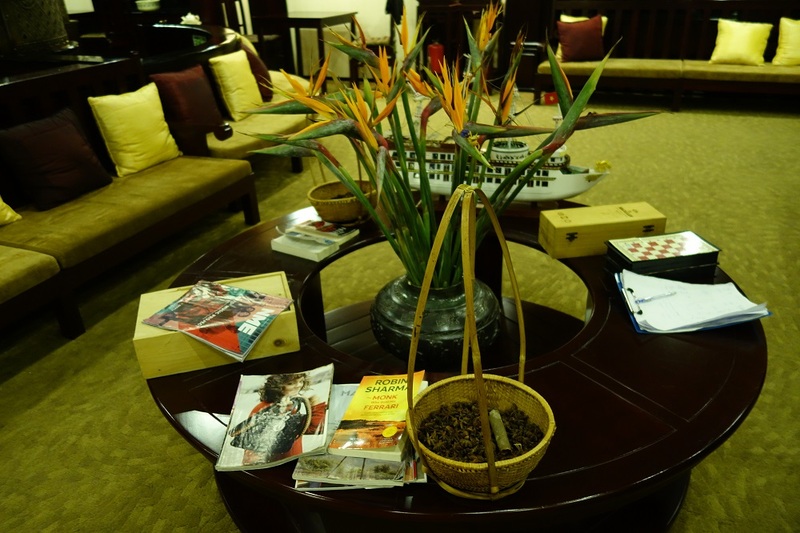 The lobby was another marvelous area of the boat. 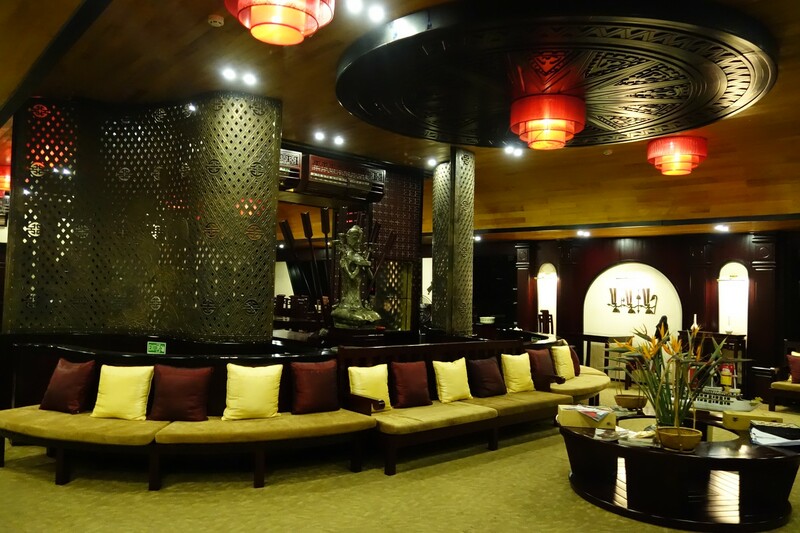 The earthy tones, oriental decors, and wooden walls and pieces of furniture make the lobby look opulent, especially at night time. 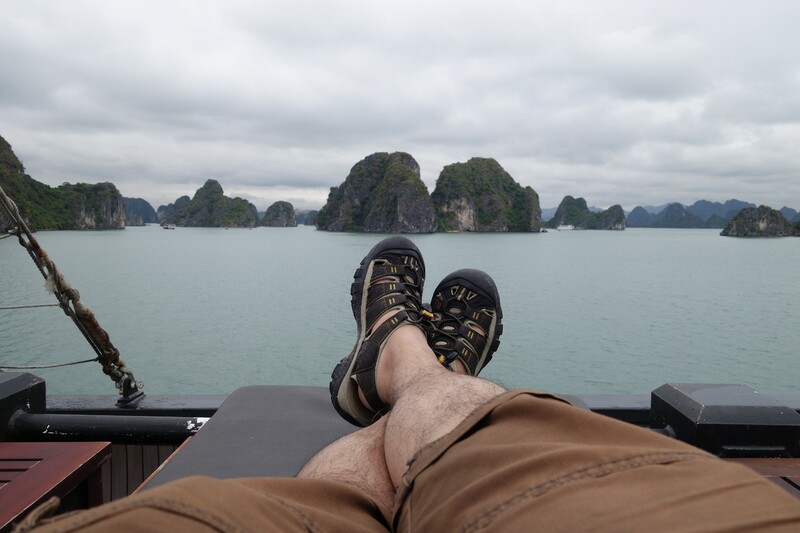 No one was actually hanging out here (most passengers were in their rooms while some were at the sundeck) but it’s a great place to relax, read some of their books and magazines, just sit quietly, or, if you like, chat with the Indochina Junk staff on duty. I really like the sundeck, though. 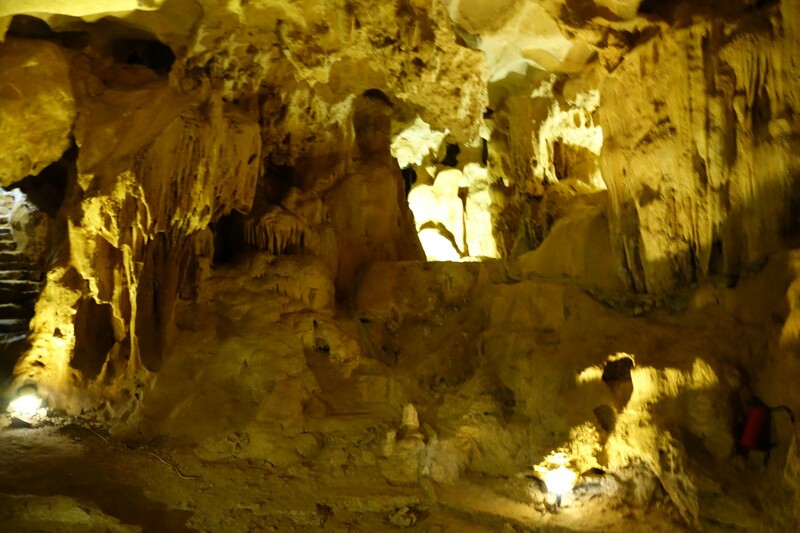 It’s a nice spot to laze around and watch the limestone karsts in the dark, which, at night, looked really creepy yet really cool too. So I went back to our room and told Mike that we should go and hang out at the sundeck. Because his jacket got wet, he had to borrow one from the staff. One of them, a young man who goes by the name Harry Potter (no kidding) willingly took off his jacket and let Mike borrow it for the night. 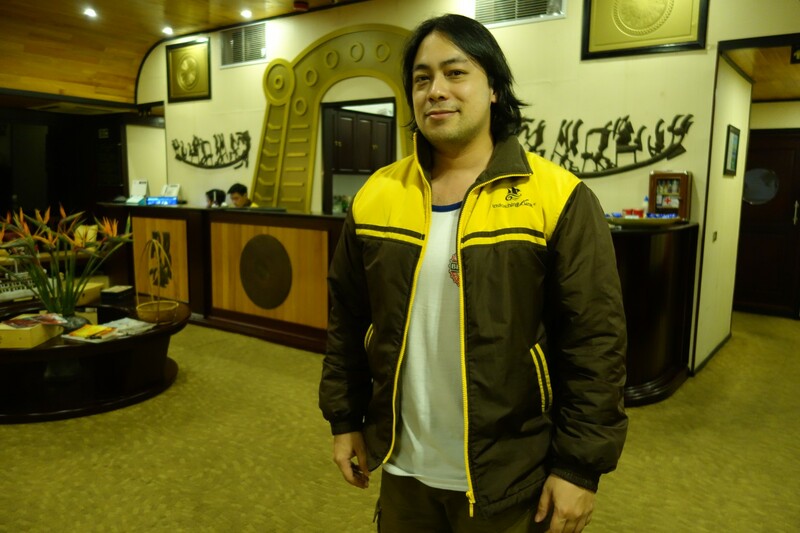 Aren’t the staff of Indochina Junk the best? Unfortunately, when we finally went up the sundeck, it had started to rain, so we went back inside and ordered drinks instead. 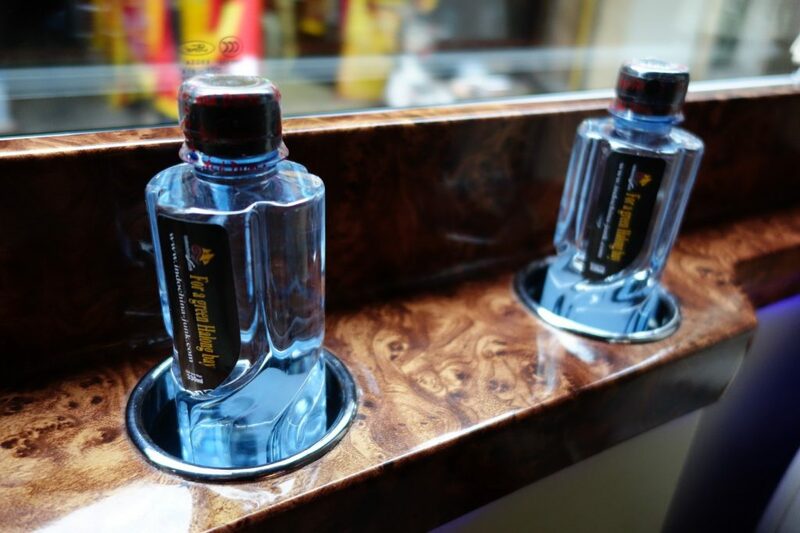 The drinks were a little pricey, but what do you expect from a 5-star cruise boat? I think all cruise companies follow a certain drink pricing standard though, so even if you choose another cruise operator, you’ll probably pay the same amount. 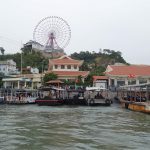 So if you’re on a budget, go to the nearest Circle K in Hanoi, get some cheap booze, and bring them with you to the cruise. 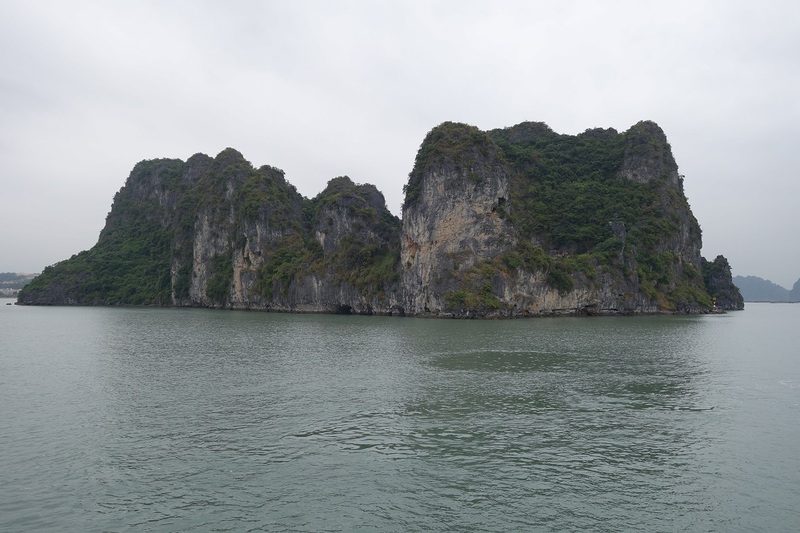 Day 2 – a brand new day at Bai Tu Long Bay! I woke up extra early to join the Tai Chi class on the sundeck. I couldn’t imagine a better place to attend a Tai Chi demonstration. Exercising and breathing the cold, fresh air with an incredible scenery was so invigorating! It was actually a “silent” Tai Chi class because the instructor was not talking. He was simply moving slowly and gracefully while the rest of us followed along. The only sound we heard was the blowing of the breeze and the light lapping of the water. 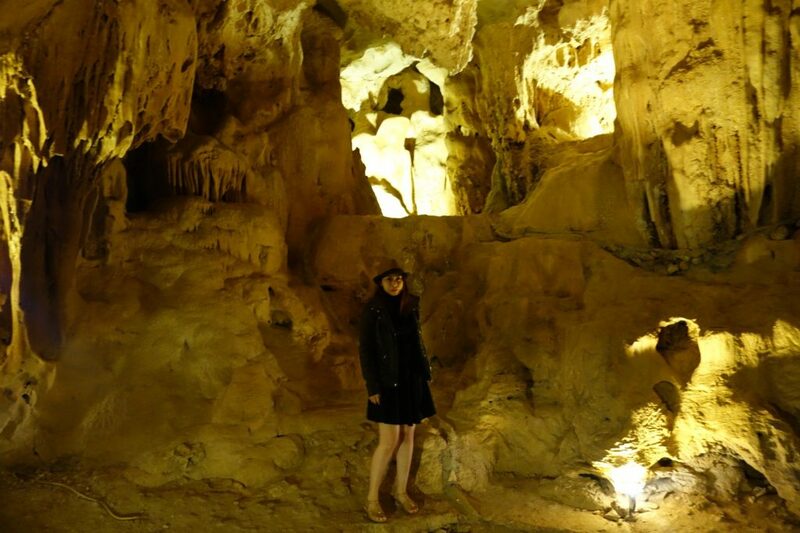 It was really relaxing! 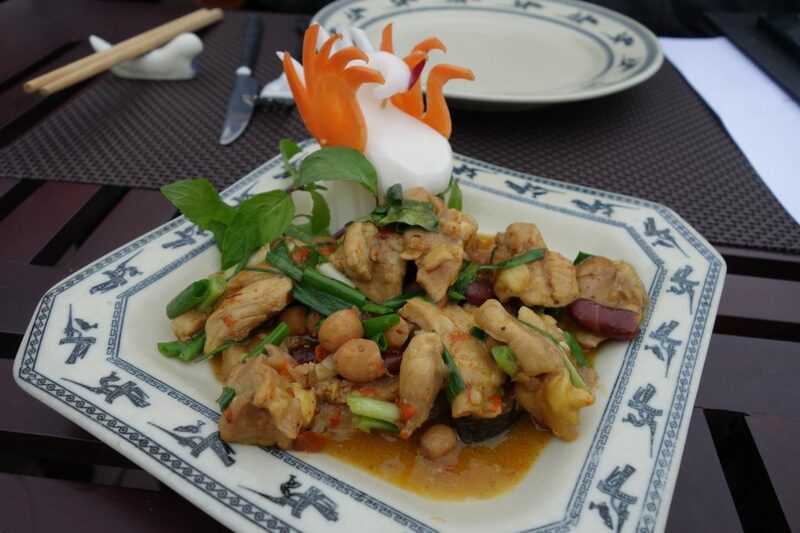 After our Tai Chi class, we went to the restaurant for a quick breakfast before departing for Thien Canh Son Cave. 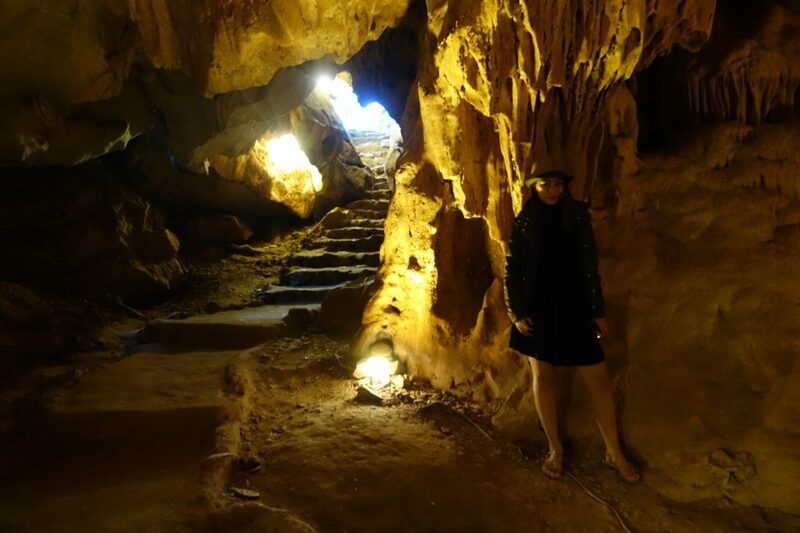 The passengers from other cruise boats were also scheduled to visit Thien Canh Son Cave. 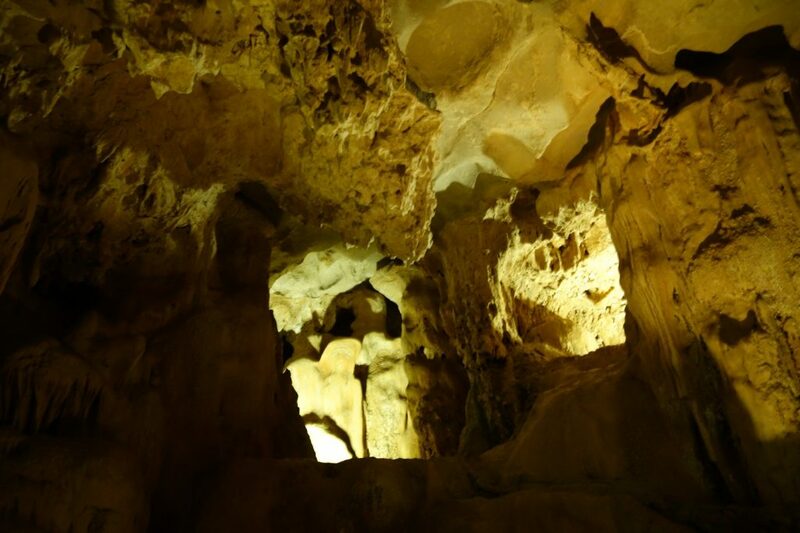 However, our itinerary was fixed by Dragon Legend in such a way that we would visit the cave later than the other passengers so that we could avoid the crowds. 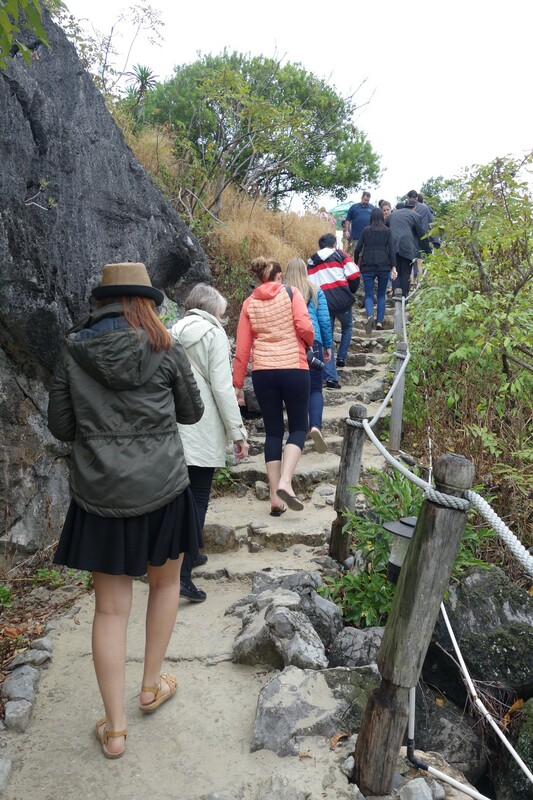 True enough, as we were climbing up the steps to reach the cave, some tourists were already on their way down. 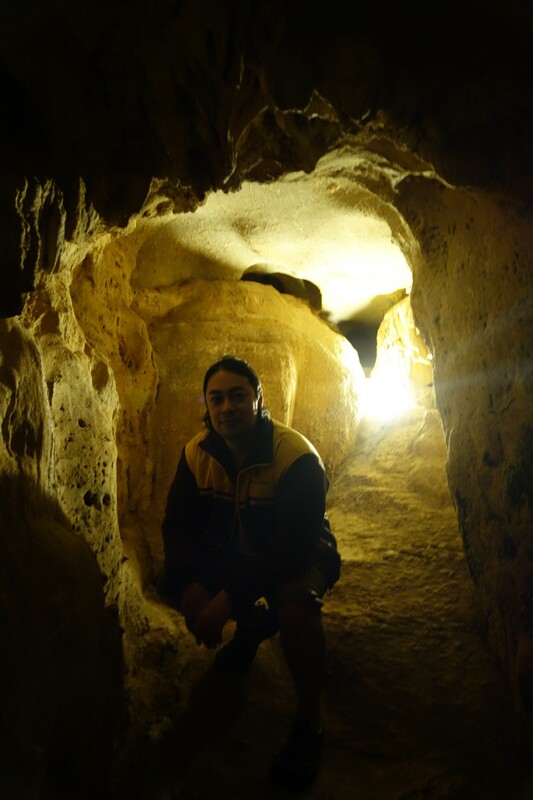 Before entering the cave, one of the boat staff who goes by the name James Bond (you read that right! 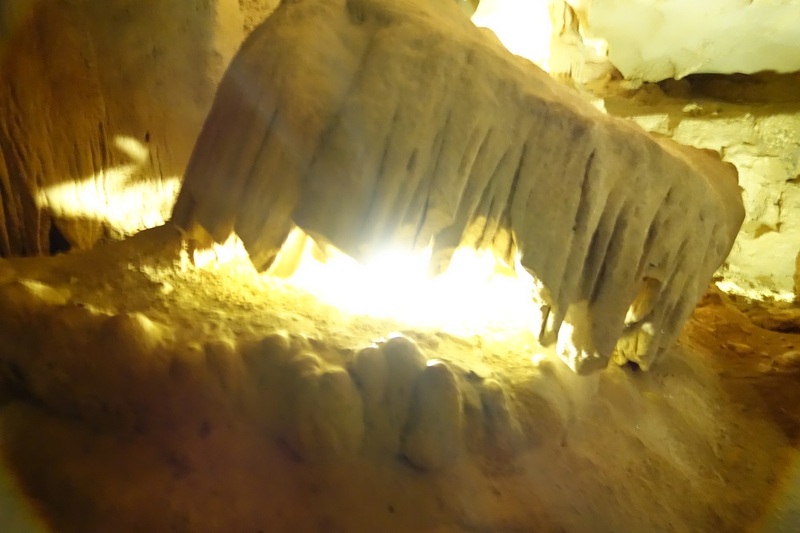 ), a soft-spoken, smiley, and kind man, told us all about the history of the cave. 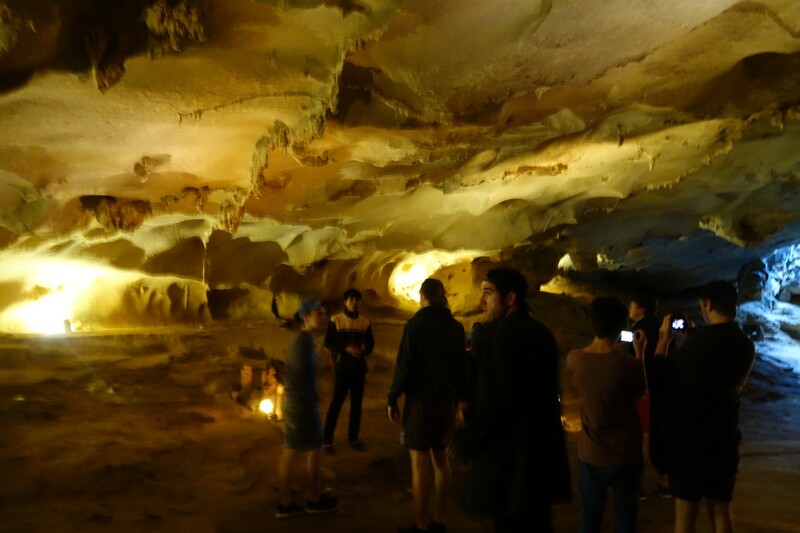 Dinners used to be arranged for tourists in this cave. 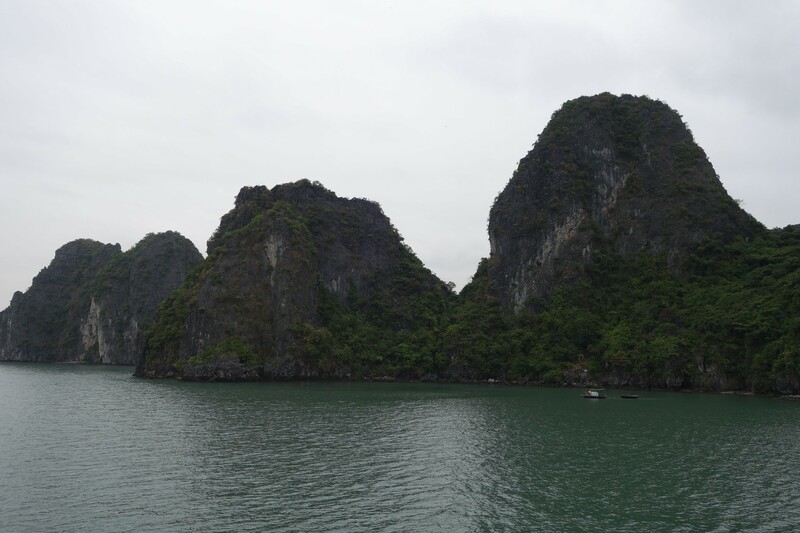 However, as of October 2016, the Halong Bay government banned all cruise companies from holding dinners in the caves in order to protect and preserve these caves. Sad that we didn’t get to experience that, but I think the rule is fair enough. 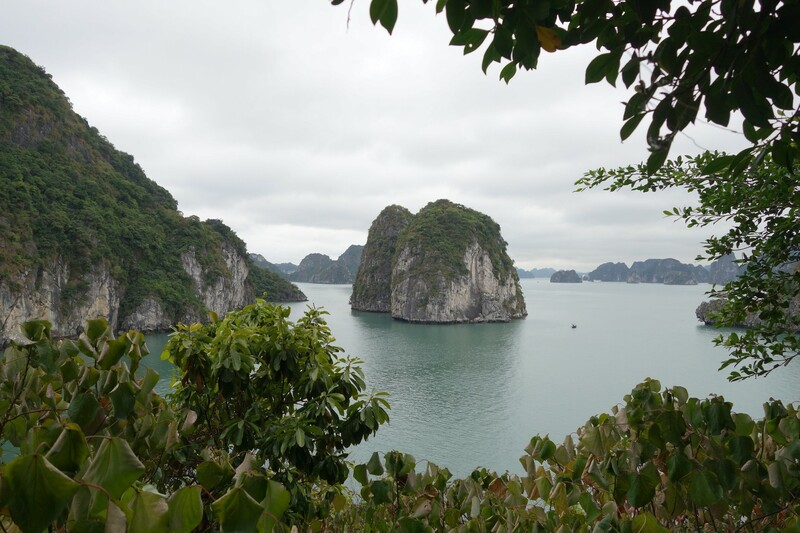 Above the stone cliffs, we also had a chance to take photos of Bai Tu Long Bay from a different perspective. 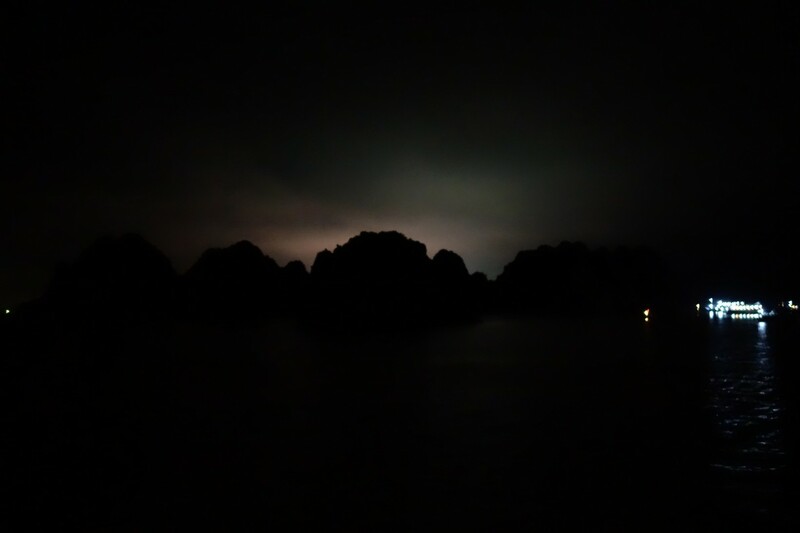 At 10:00, we got back to the boat and started fixing our things and checking out. We really wish we could have checked out at 12:00 instead. Two more hours to maximize and relish our time in the boat would have made a world of difference! 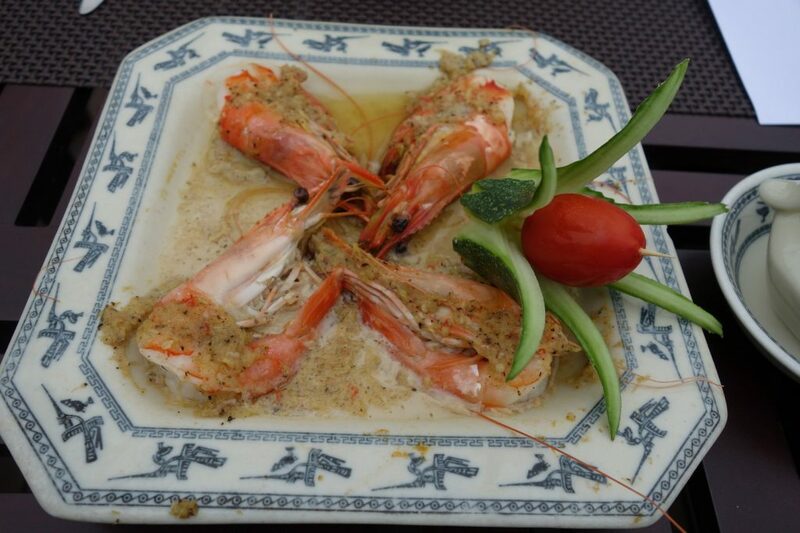 Our previous meals in the boat were served one by one, but on our last day, we had a buffet lunch. 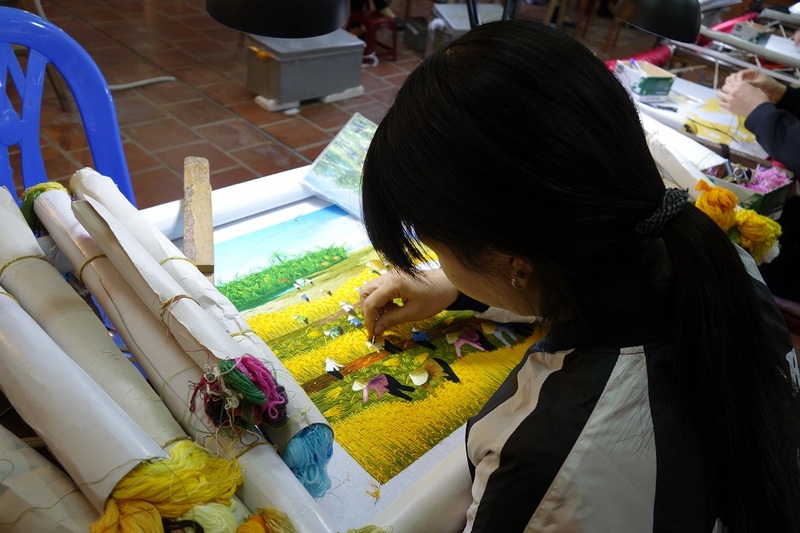 After lunch, the itinerary for passengers on a 2D/1N cruise would be to drive to Yen Duc village – a Vietnamese agricultural village – and watch a water puppet show. 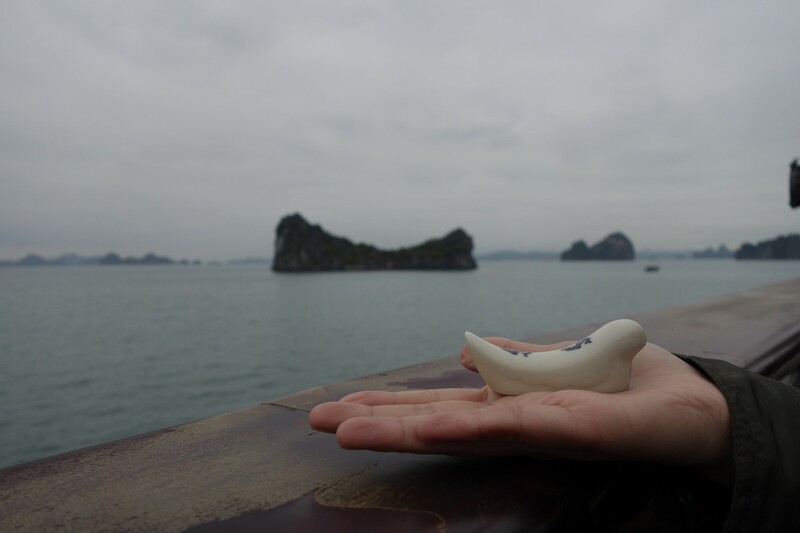 However, Mike and I decided to skip the water puppet show, along with two other couples. 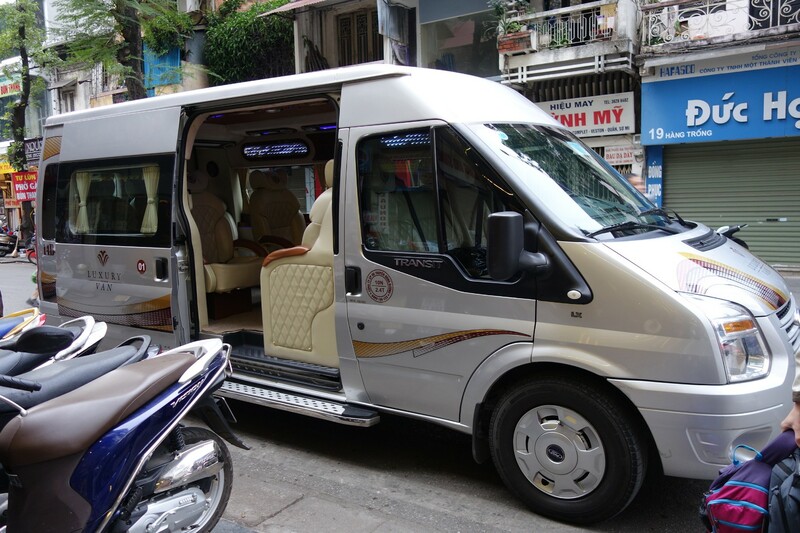 We were told that if we could form a group of six people who prefer to go back to Hanoi instead of joining the Yen Duc tour, one van could take us all back to the city. 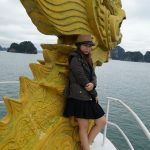 The two ladies with us were feeling quite ill so we were all allowed to go straight to Hanoi. Mike and I were glad we did this because we got back to the city much earlier and had a little more time to explore it. 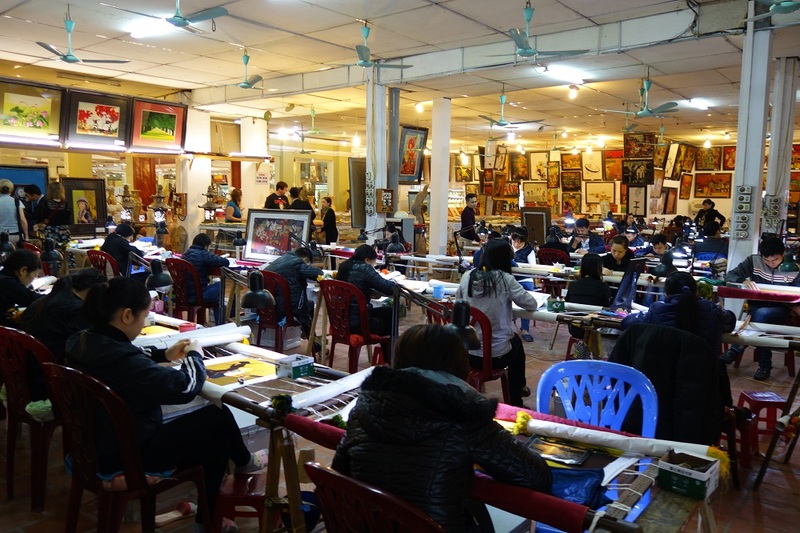 Anyway, we figured that if we decided later on that we wanted to watch a water puppet show after all, there are a few theaters in the Old Quarter where we can do that. 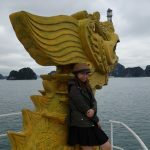 Our 2-day cruise onboard the Dragon Legend was, no doubt, one of the highlights of our Hanoi trip. 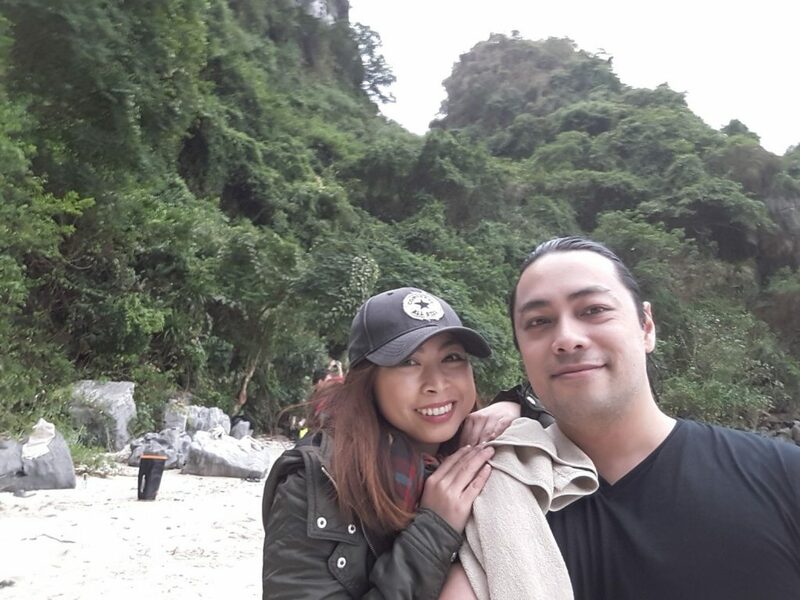 Mike and I are simple people and don’t always live like royalty, so for a change, it was nice to travel luxuriously! 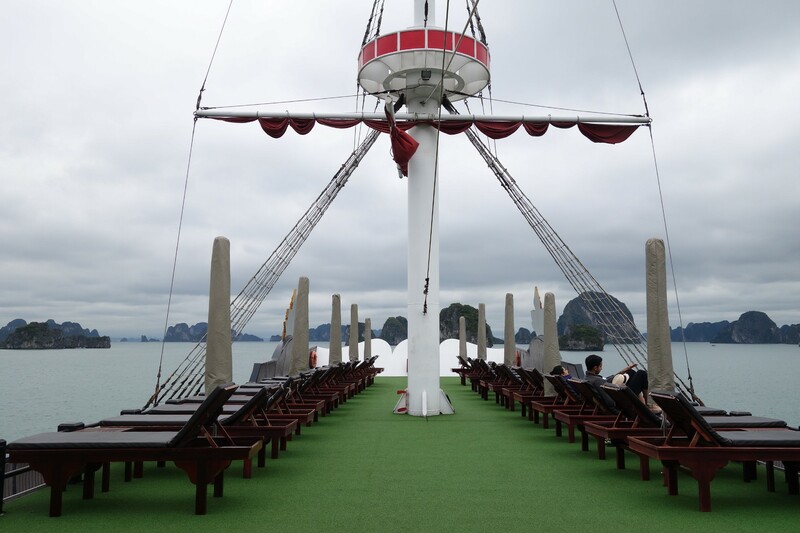 From our room to the sundeck, each area in the boat had a feeling of grandeur. 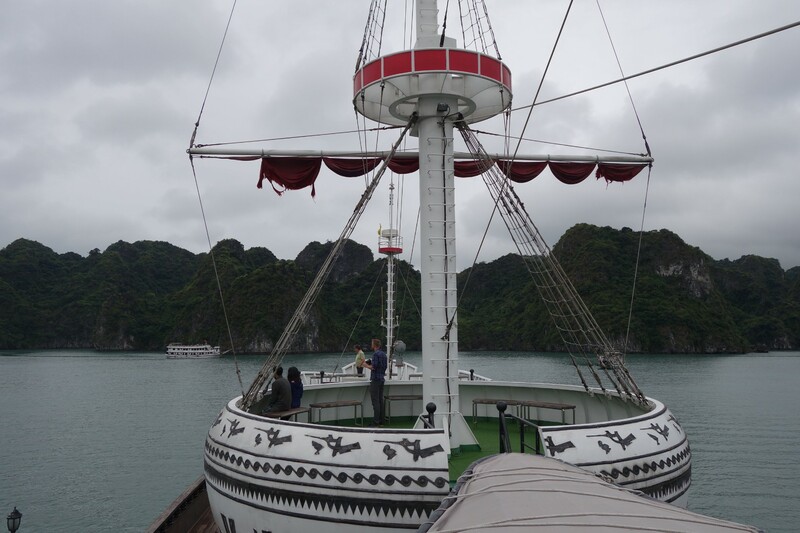 The boat was not only beautiful but it was also clean, comfortable, and spacious. 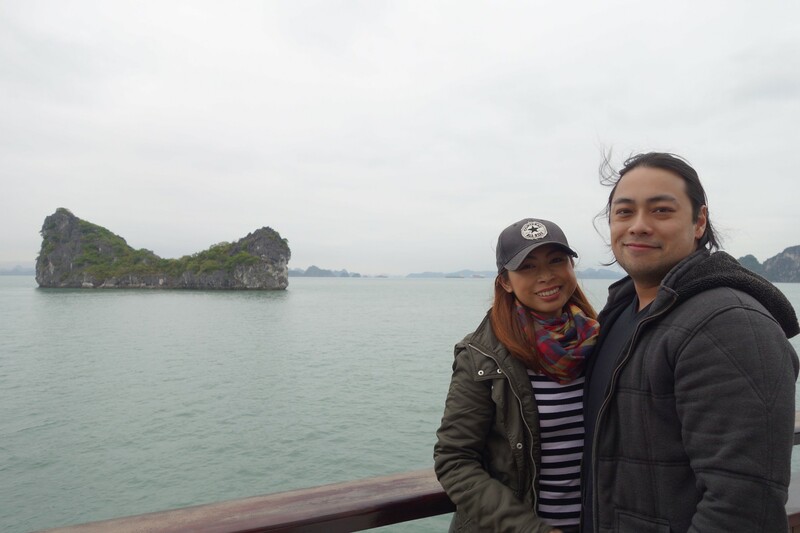 Mike and I have never been on a cruise before, and at first, we didn’t know if we are the “cruising kind of people.” We love to just chill out, but we also like being active from time to time. 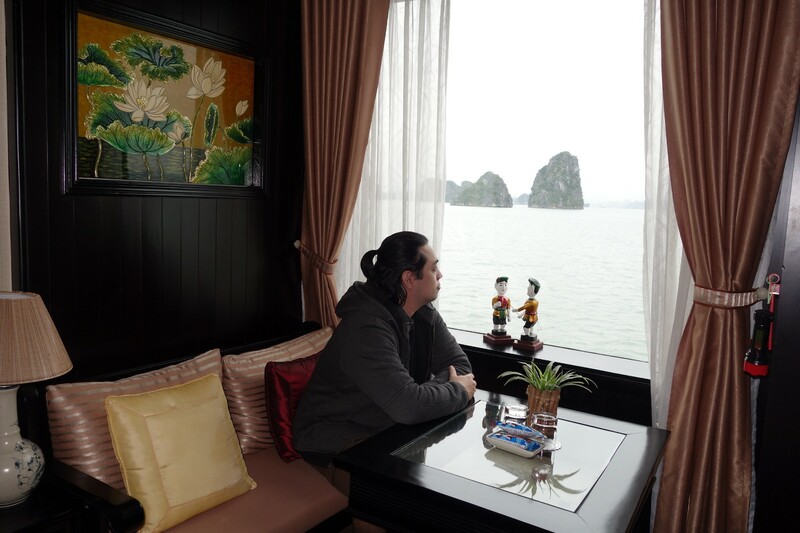 The Dragon Legend was a good mix of both relaxation and adventure. 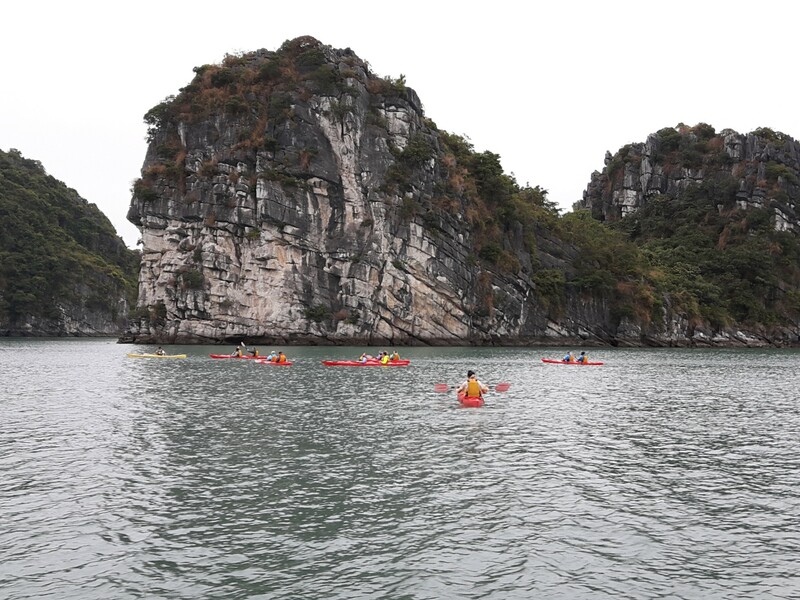 We were given time to take a breather and take pleasure in the view of the bay, but we also engaged in physical activities like kayaking and climbing up a cave. 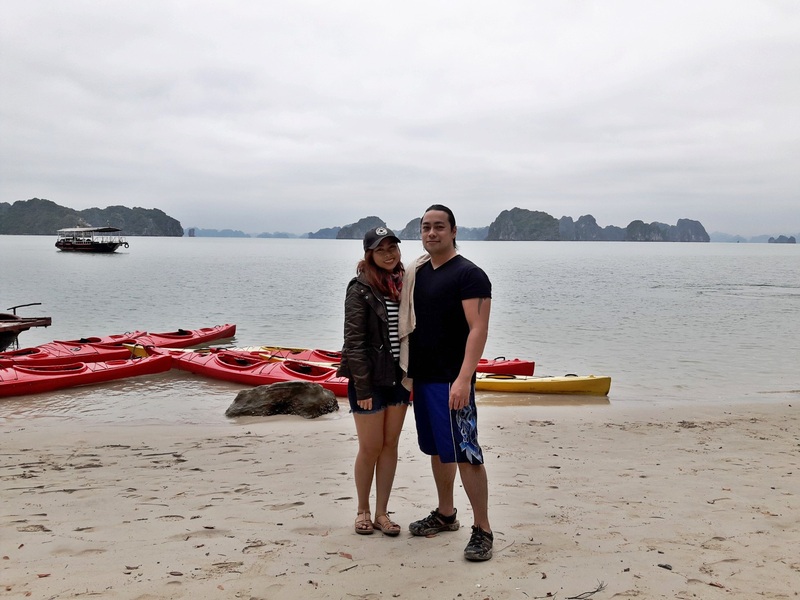 The passengers of the Dragon Legend consist of couples like us who are also celebrating a special event like a honeymoon or an anniversary, a small group of young adults, and families. 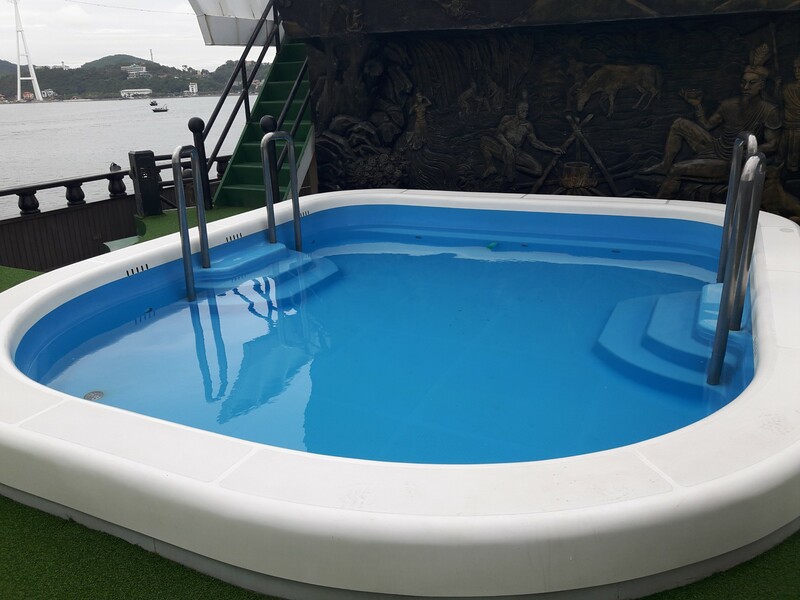 If you’re looking for a party boat with lots of drinking games and loud music, you might want to look elsewhere because this is not what the Dragon Legend offers. 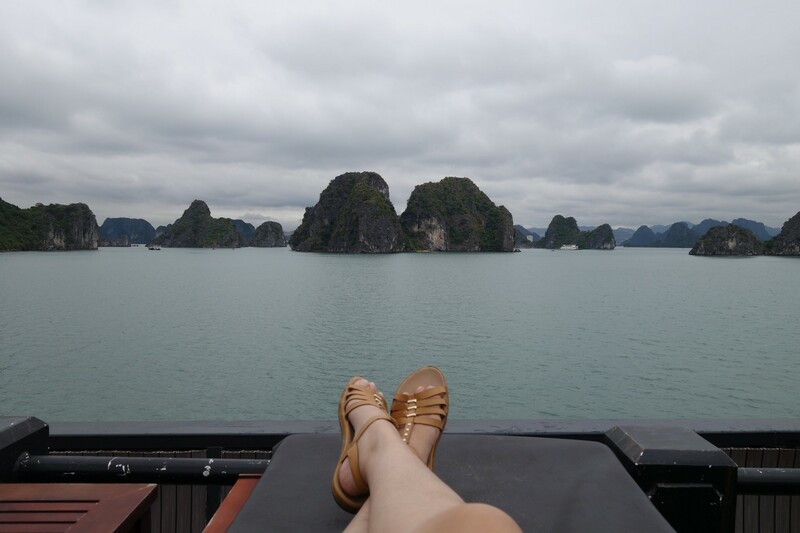 One thing to note is that this is a large boat that can take up to 50 passengers, so it’s not exactly what I would call “intimate.” However, based on experience, though our cruise was fully booked that day, sharing the boat with 45 other people wasn’t bothersome at all. There’s so much room in the boat that it never felt crowded and there’s plenty of space to enjoy a quiet and intimate time with your companion. 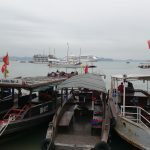 Also, it’s a big plus that the Dragon Legend sails through the more peaceful route of Bai Tu Long instead of the more congested Ha Long Bay. 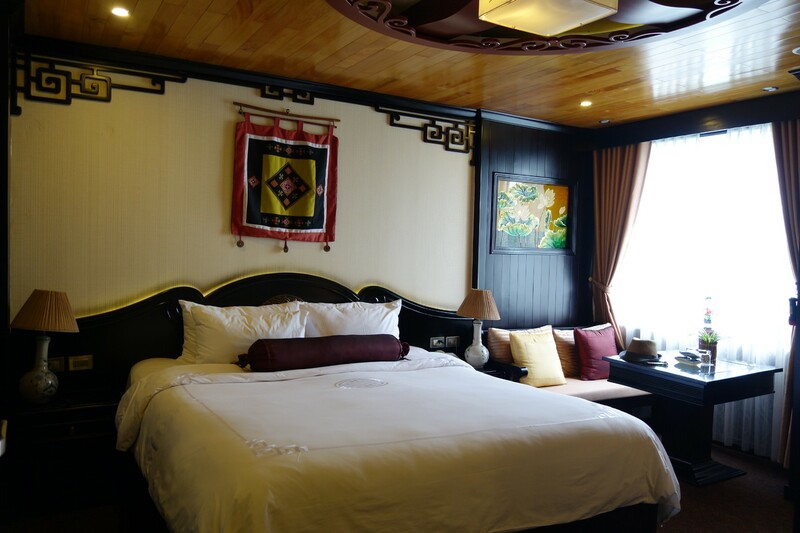 …there’s enough room for you and your companion to enjoy onboard the Dragon Legend boat. The real legends of Dragon Legend are its staff. No doubt about it, all of them are very cordial and helpful. They were always glad to serve and do whatever they can to ensure that we are happy, satisfied, comfortable, and safe. 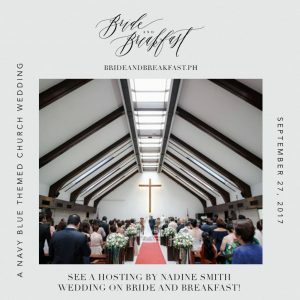 From our first encounter with them – even before we even set foot in the boat – it was easy to tell that they were looking after us and were eager to please us. The real Dragon Legends: the remarkable crew who made our cruise so enjoyable! I’m sure there are other nice boats out there from other good cruise companies. But there is a reason why Indochina Junk is always number one, and why most of the reviews about them are excellent. 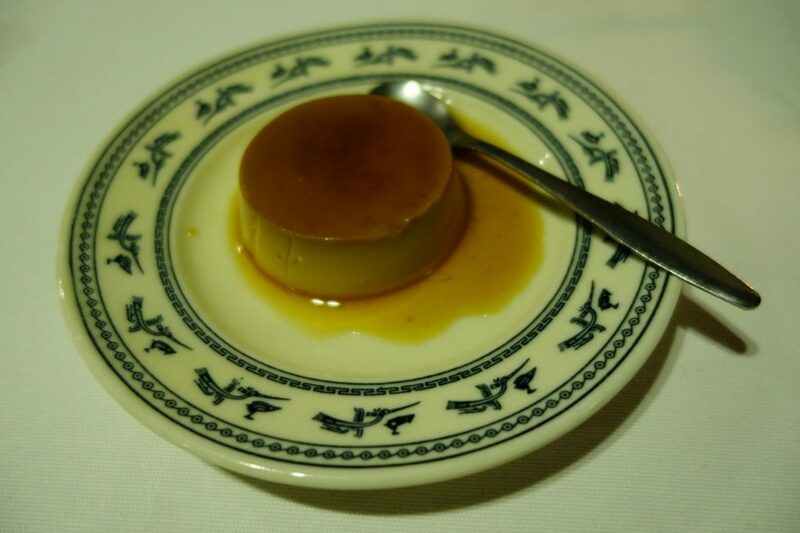 Personally, we think they can do better with the food in terms of presentation and portions, and perhaps they can find a way to space out the activities so that they don’t feel too rushed. 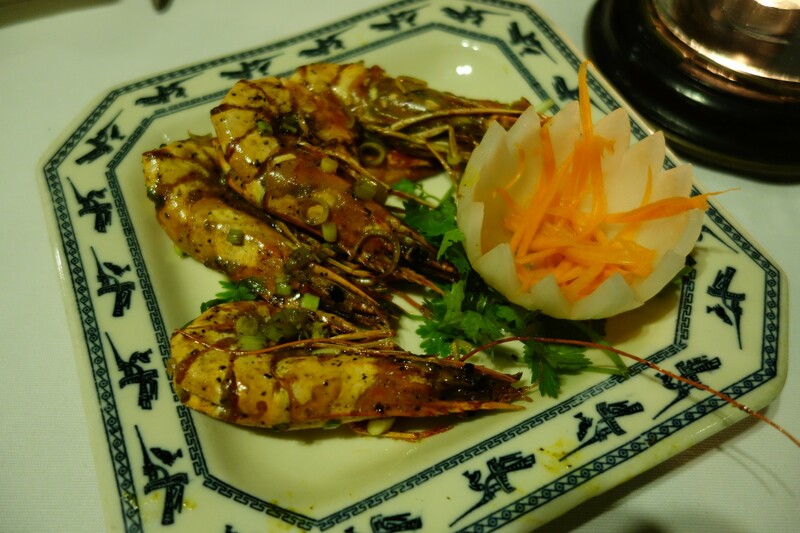 However, overall, we were very happy with our experience and I’m glad we chose Indochina Junk (particularly the Dragon Legend) to help us celebrate our wedding anniversary. 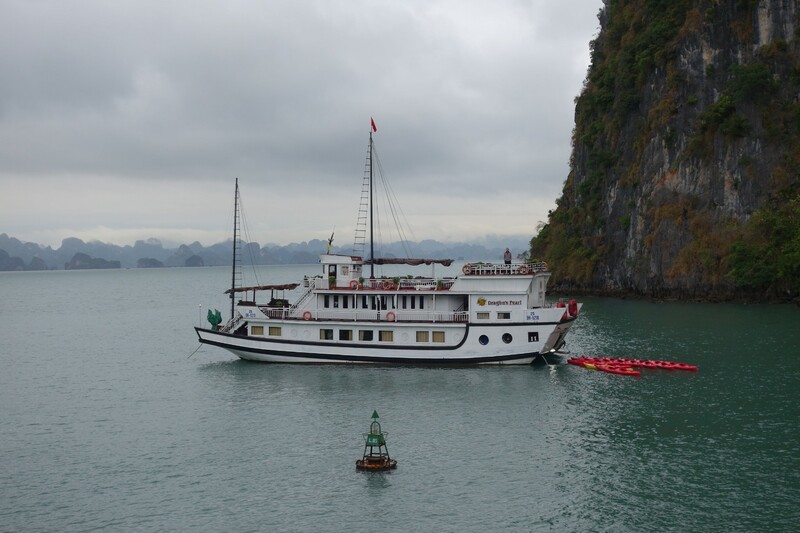 THINKING OF GOING ON A HA LONG BAY OR BAI TU LONG BAY CRUISE? My number one piece of advice? Don’t think, just GO! 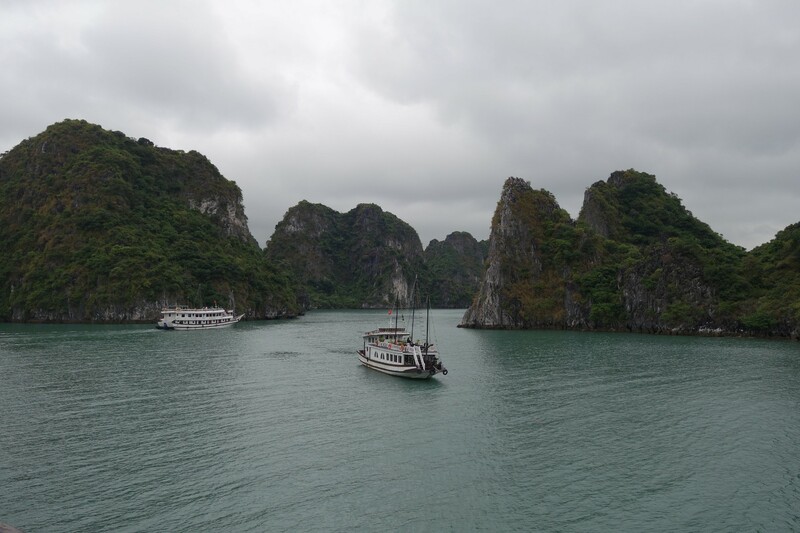 Keep in mind that the ride from Hanoi to Halong Bay and back takes 4-5 hours each. If you add that up, that’s 8-10 hours on the road! 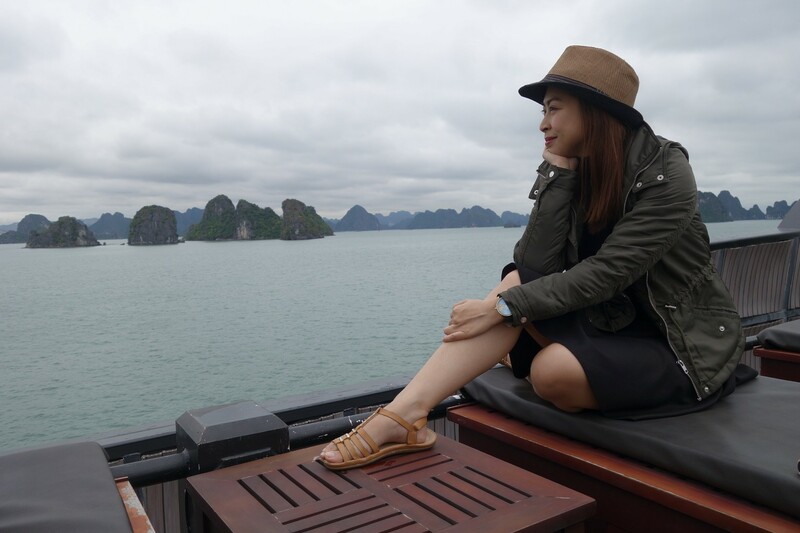 Going on a cruise will eat up a lot of time, and with so many things to see in Hanoi, two full days to explore it wasn’t enough! But two days is better than nothing, right? It was a lot cleaner and more tranquil than I expected! 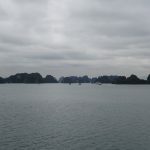 To preserve and care for Halong Bay, Indochina Junk and other cruise companies, in cooperation with the Halong Bay Management Board, are actively promoting responsible travel and environmental protection through their “For a Green Halong Bay” program, which includes collecting and treating waste in Halong Bay, among many other activities. We didn’t see any trash floating around when we went! 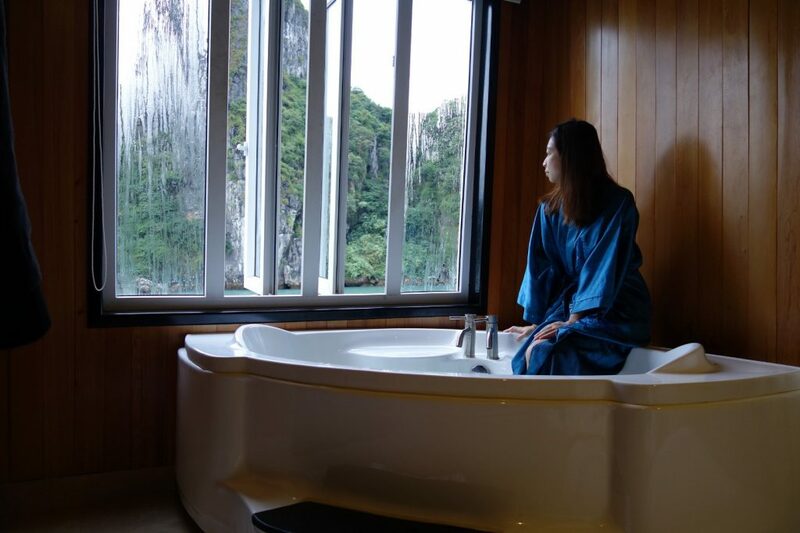 If appreciating the beauty of nature and the restful seascape is what you’re after, you’ll get what you want in Bai Tu Long Bay. Mike and I really had a great time at the Dragon Legend, and hopefully, one day, we get to go on a cruise with them again with our families! 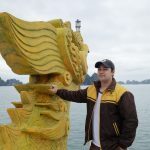 Disclosure: I was given a special rate by Indochina Junk in exchange for a review of their service on my blog. I paid for the cruise. All opinions are my own and are not influenced in any way. Such an amazing place. It seemed both of you have had a good time. 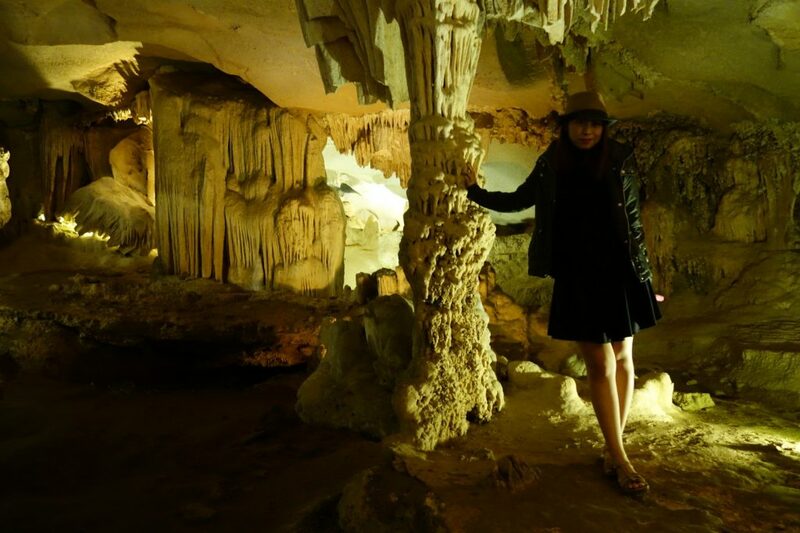 It’s one of my dream destinations. I have never been on any Cruise till now. 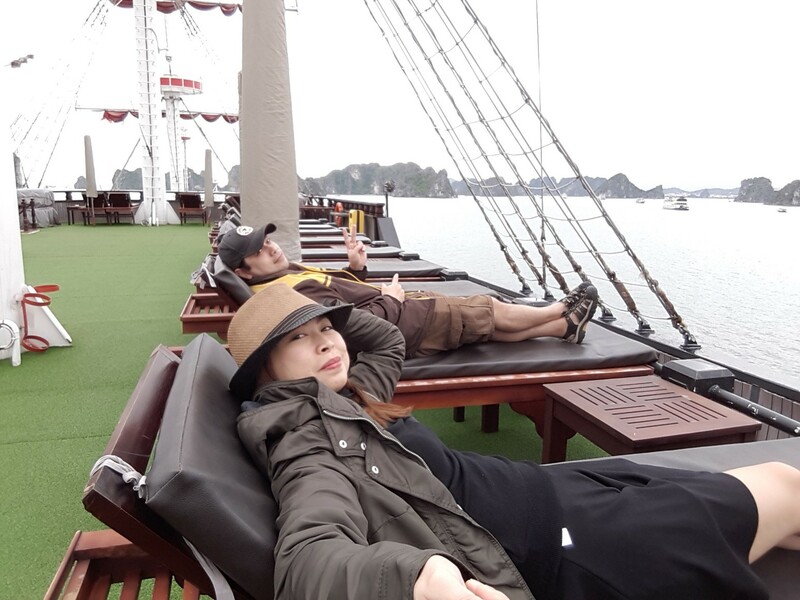 Going by the details and pictures in your post, I can only imagine how amazing it would have been like to sail away with such a huge ship which looks like a mini city in itself. 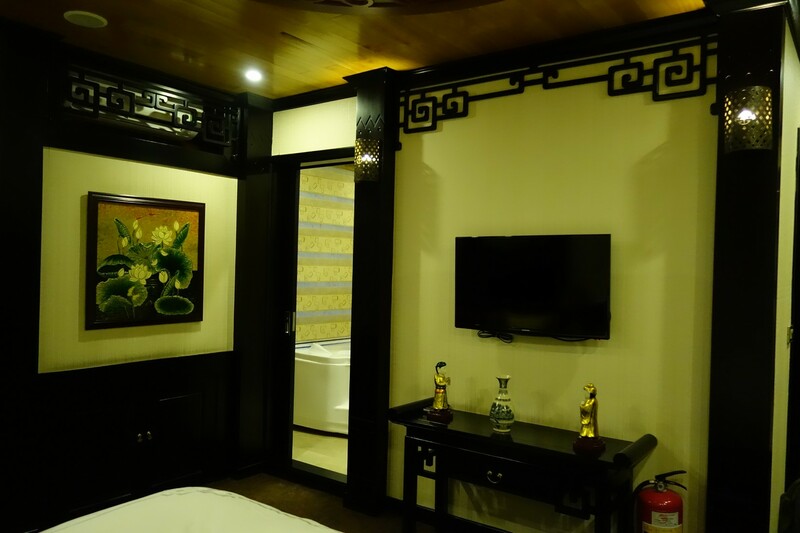 Love the suite for its size and amenities. I never knew they had such huge suites onboard. I love a little luxury once in a while as well. 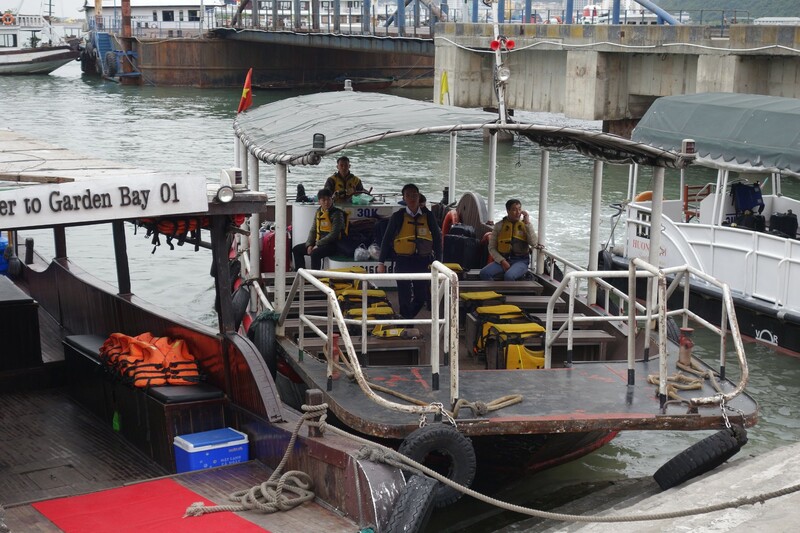 Seems like the tour company made up for the small inconveniences before boarding once you were actually on the boat. 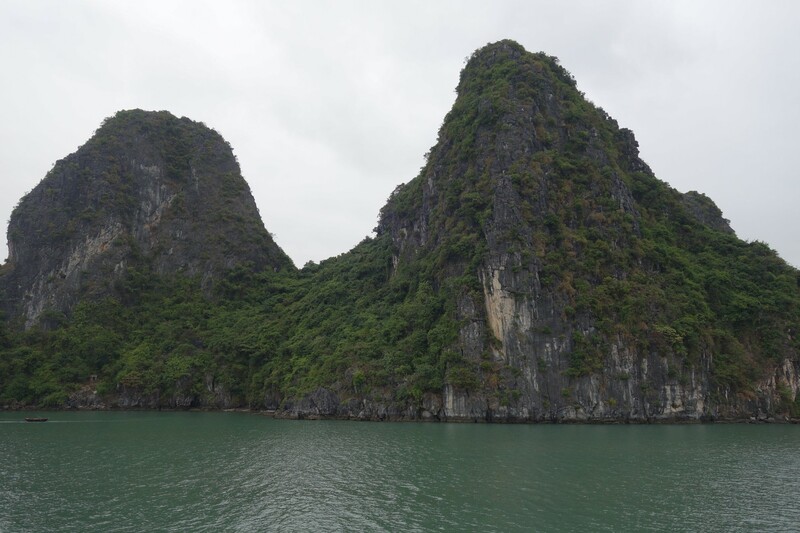 I can’t wait to go to Vietnam and explore Halong Bay as well. Keeping this post bookmarked for future reference! 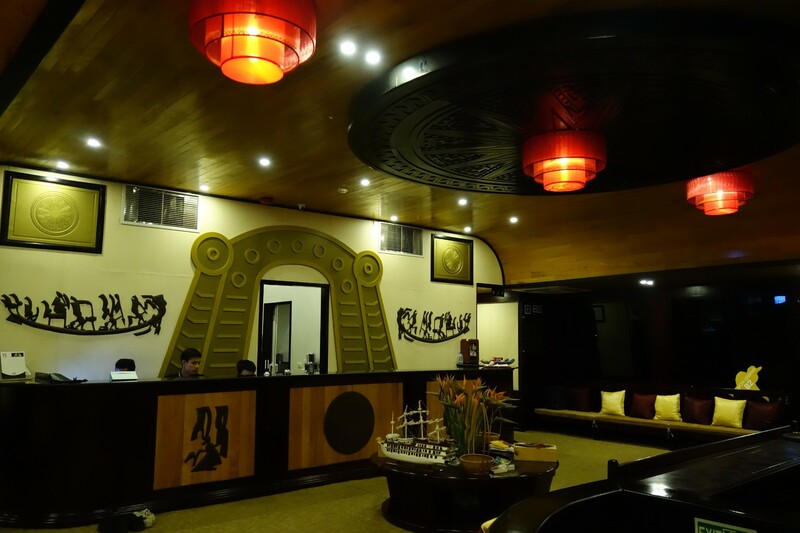 Wow, the Indochina Junk’s Dragon Legend looks so luxurious – the room is amazing! 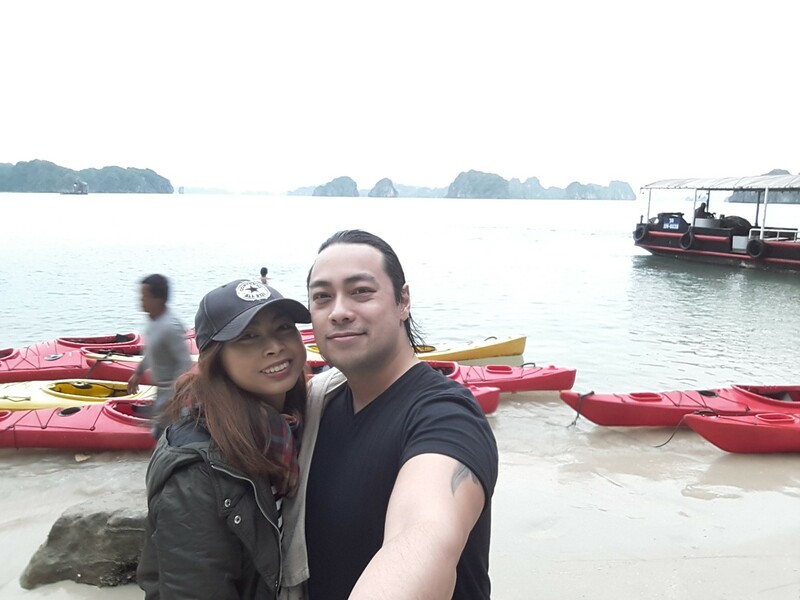 Definitely looks like the best way to explore Halong Bay, happy to hear you treated yourselves on your wedding anniversary! Where will you go next year?! 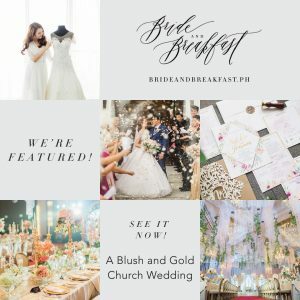 I’m not very attracted by the idea of going on a cruise, but your post and photos are simply amazing; that’s why I also pinned this post. 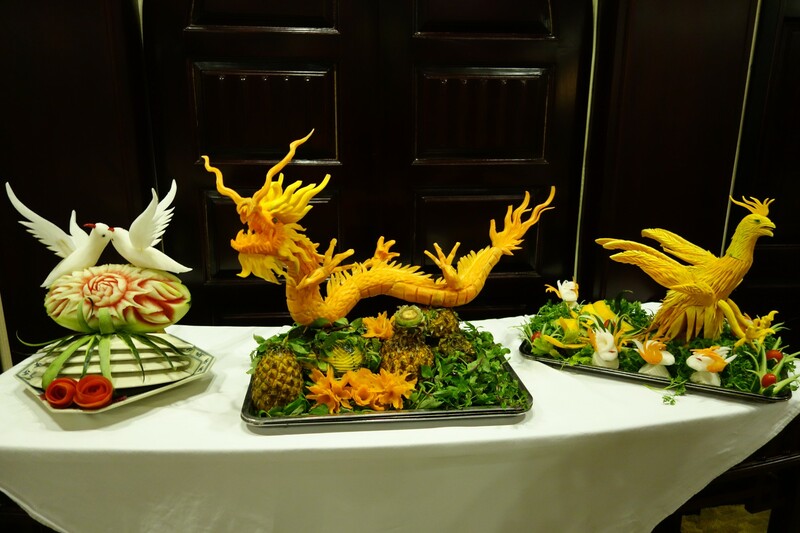 Loved the dragons and birds decorations with vegetables. 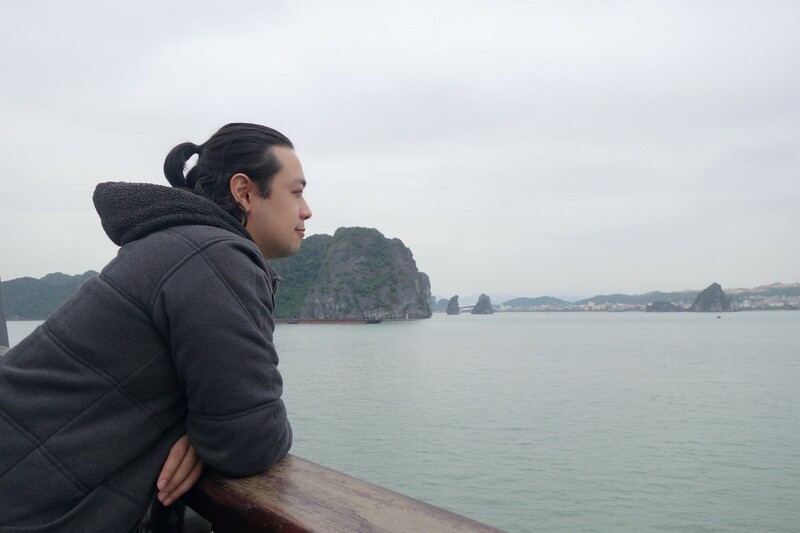 Anyway, back to your story, I didn’t try the Ha Lo Bay cruise because it’s too far away from me and yeah, it’s expensive according to my friends. Glad that yours went was not cancelled. 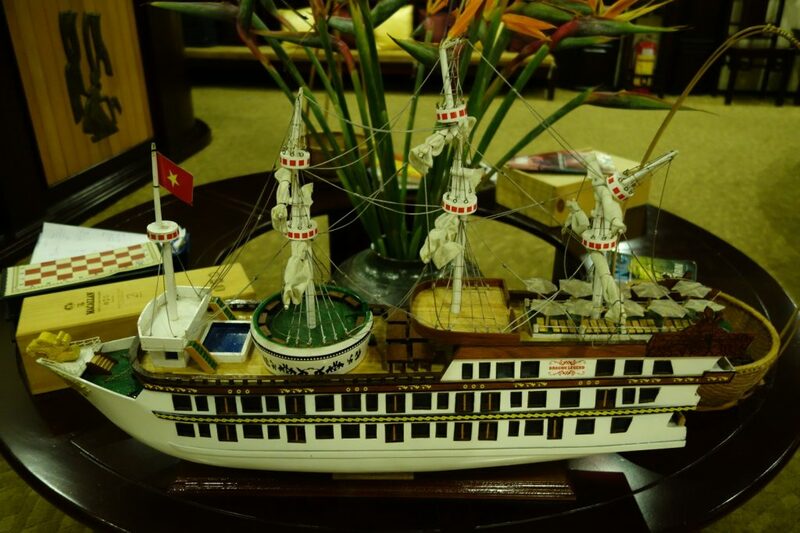 I must say that the ship is really beautiful, heck it doesn’t even look like a ship to me, it looks like a hotel. No wonder it’s expensive. 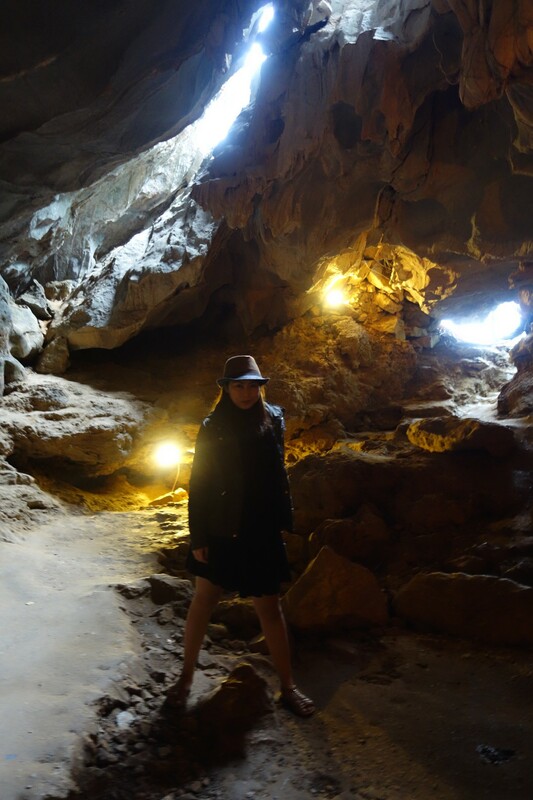 The thien canh son cave looks quite interesting. If I were in that tour, it’d probably be my favorite. Thanks for this very detailed write up! The Dragon Legend seems awesome.